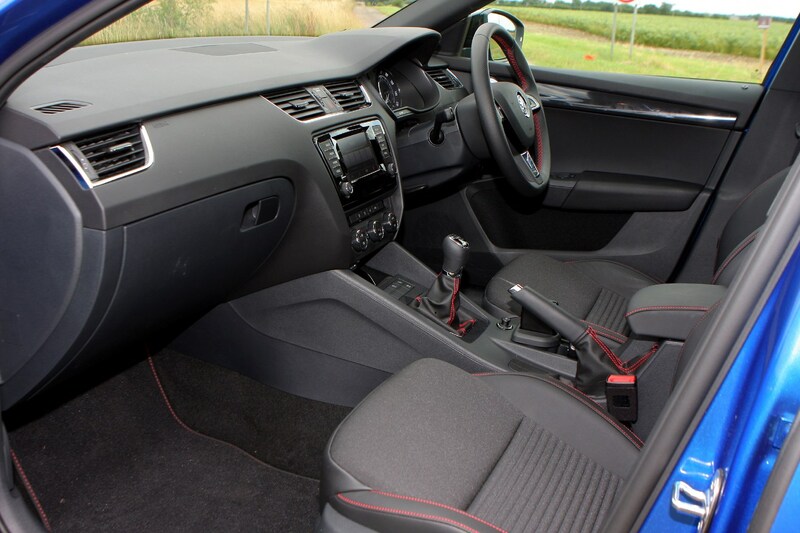 Insurance group: 26 - 30 How much is it to insure? 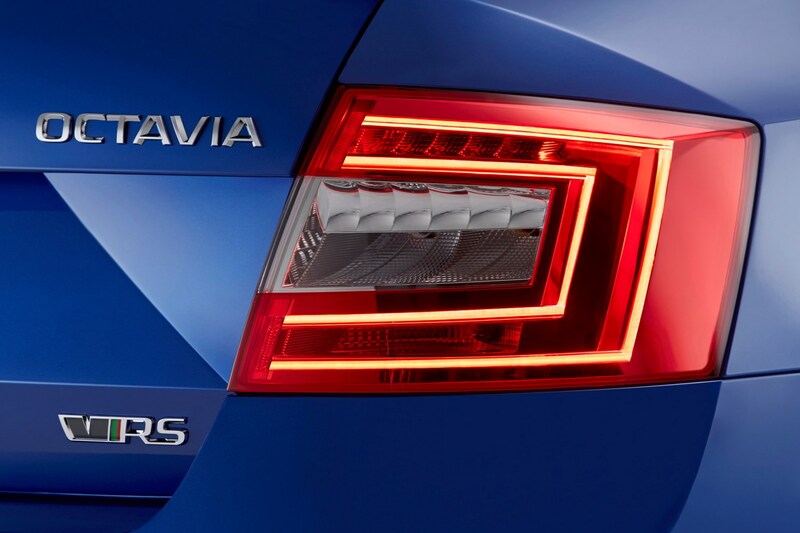 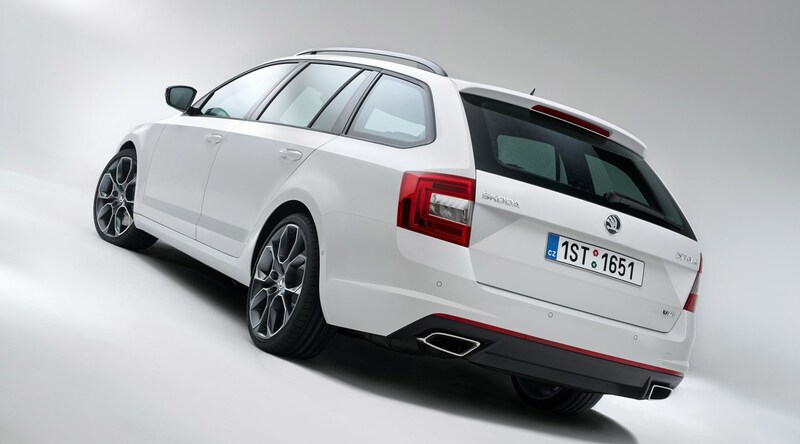 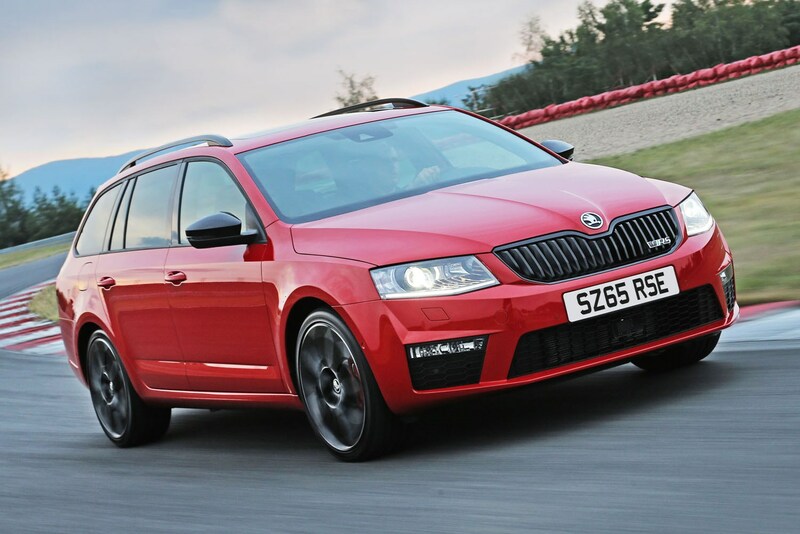 This is the all-new Skoda Octavia vRS, a high performance version of the regular Octavia available as either a hatchback or estate. 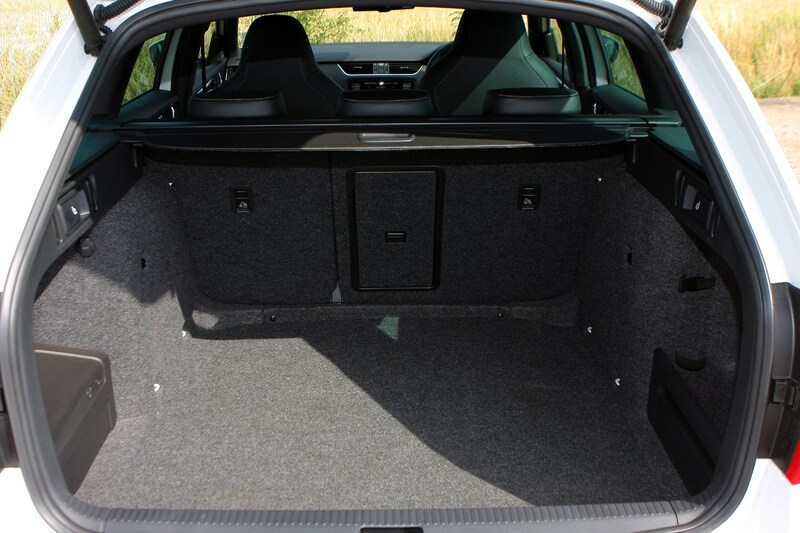 Where the former has an incredibly large boot, the latter is slightly bigger and offers a different-shaped boot opening. 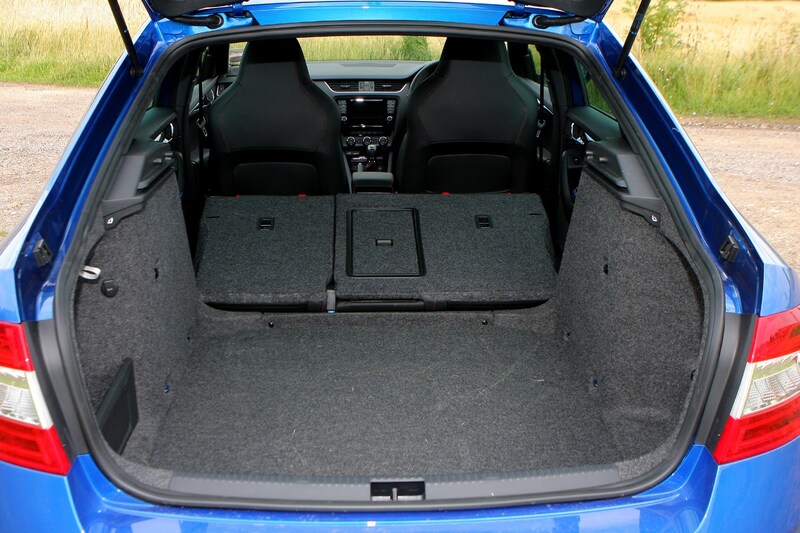 Which you choose will be largely down to what you're likely to be carrying, since there's absolutely no performance or efficiency difference. 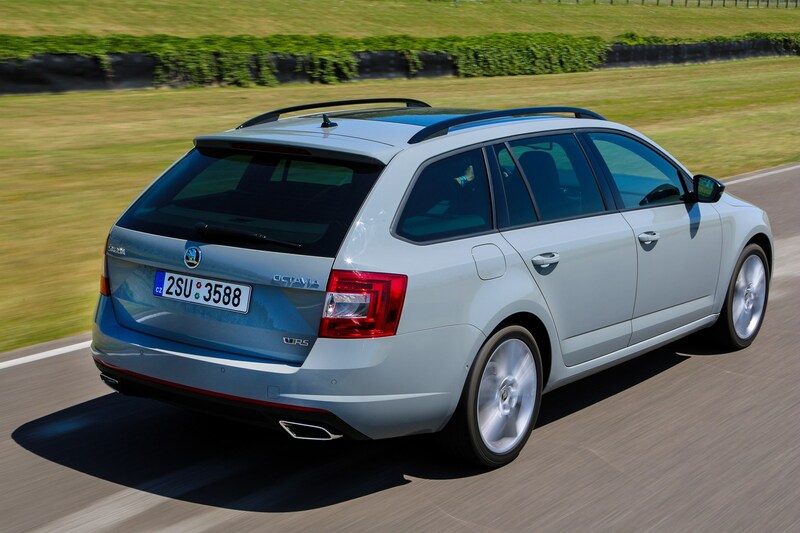 The estate is slightly more expensive, though. 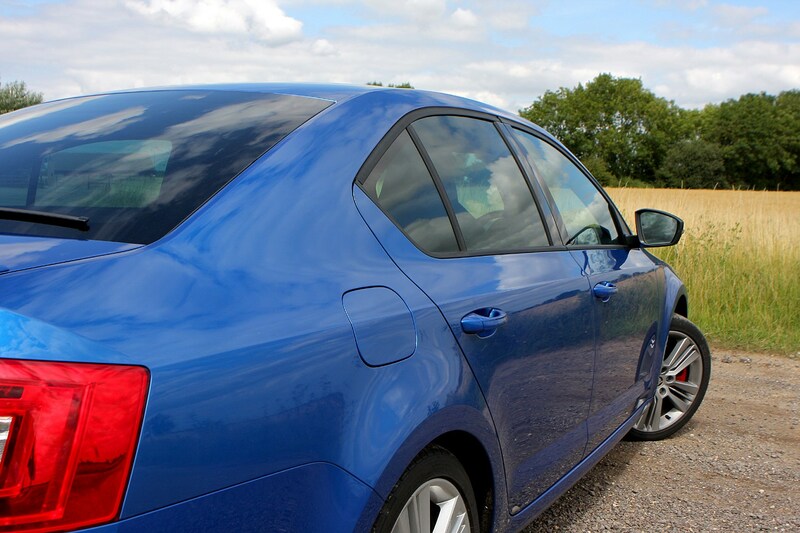 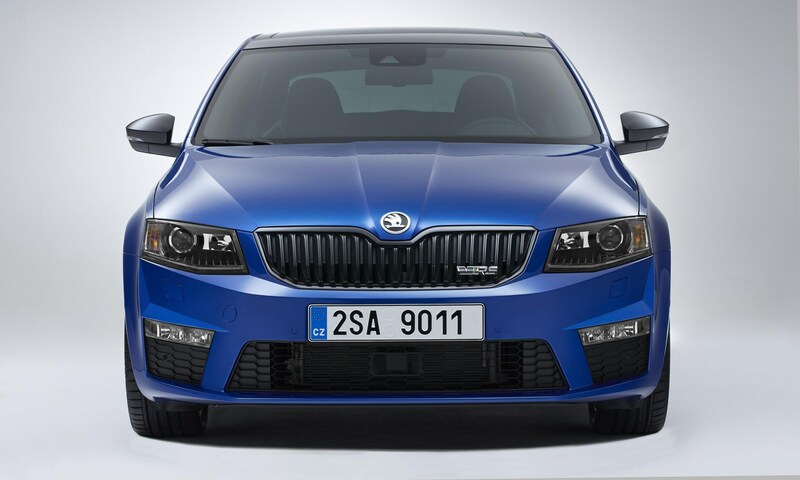 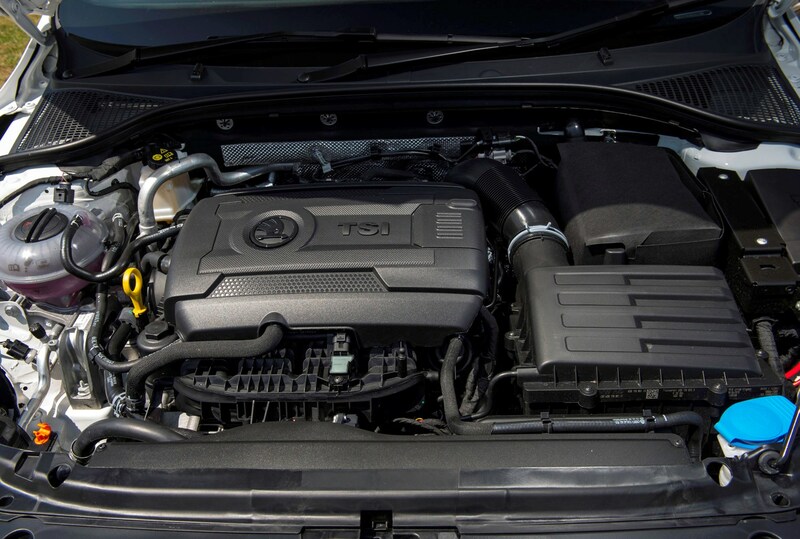 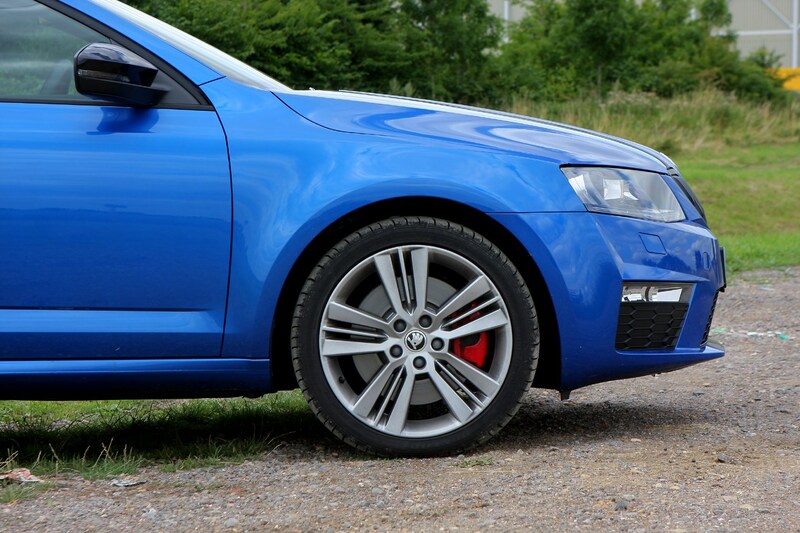 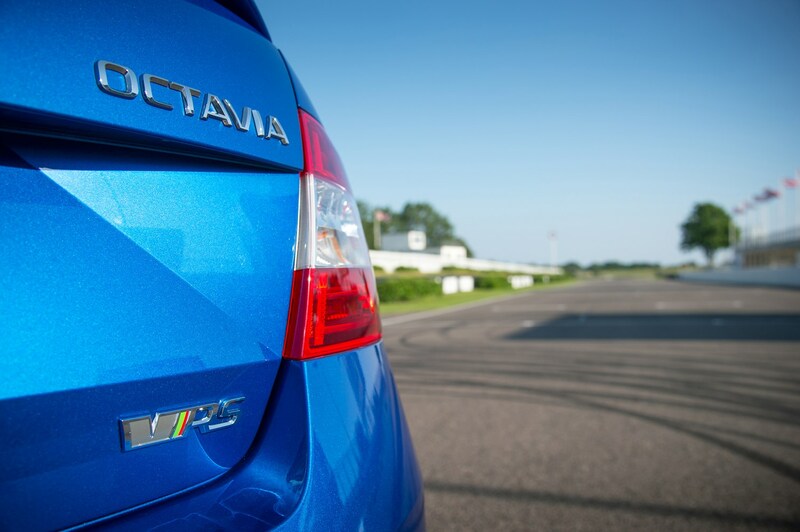 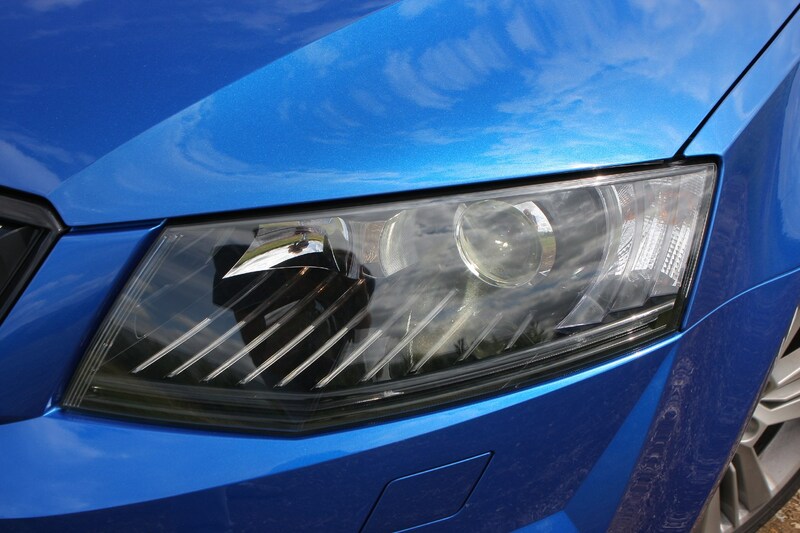 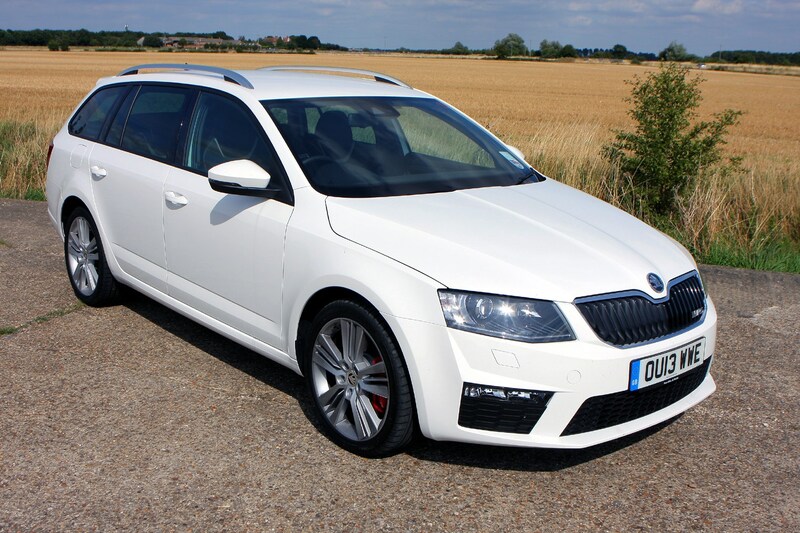 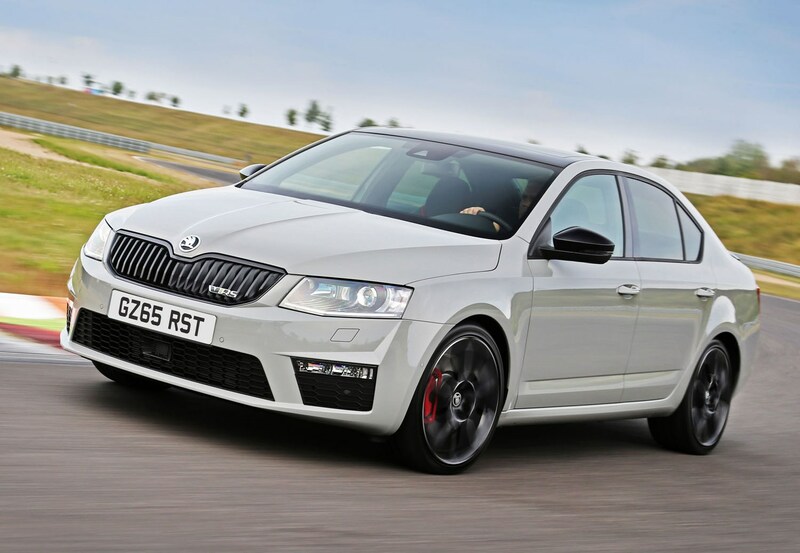 While it’s based on the same architecture as the Golf GTi, the vRS actually boasts a higher top speed. 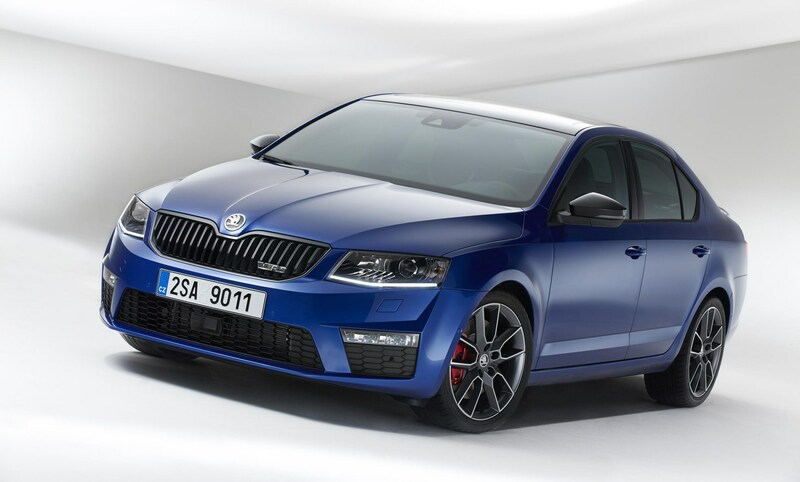 Capable of 154mph, it eclipses the famous Golf’s by 2mph. 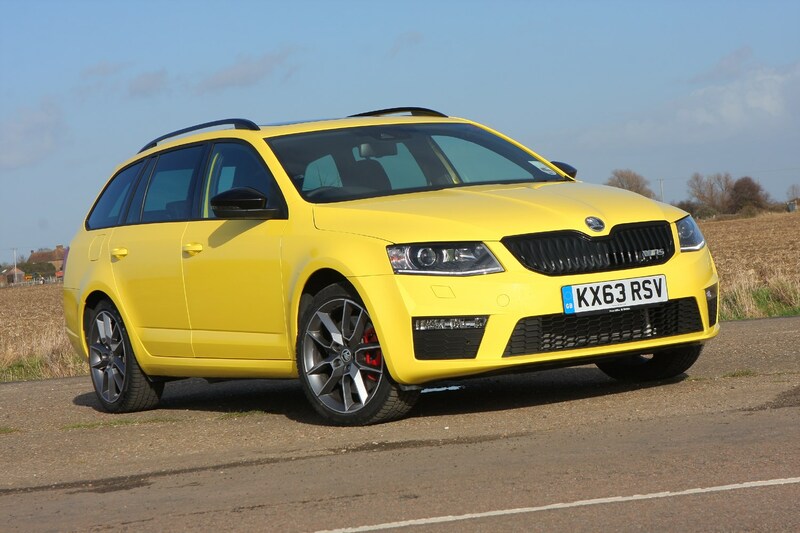 It’s not quite as quick to 62mph though, taking 6.8 seconds compared to the GTi’s 6.5. 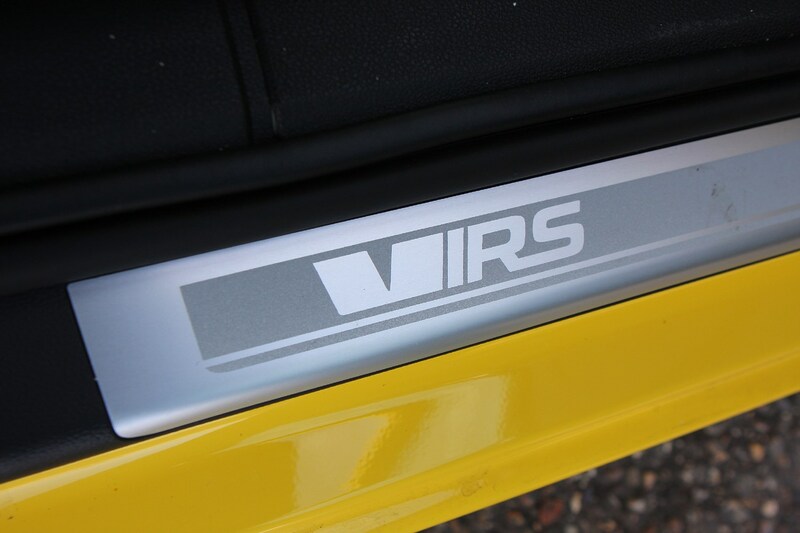 As a package the vRS is pretty hard to beat. 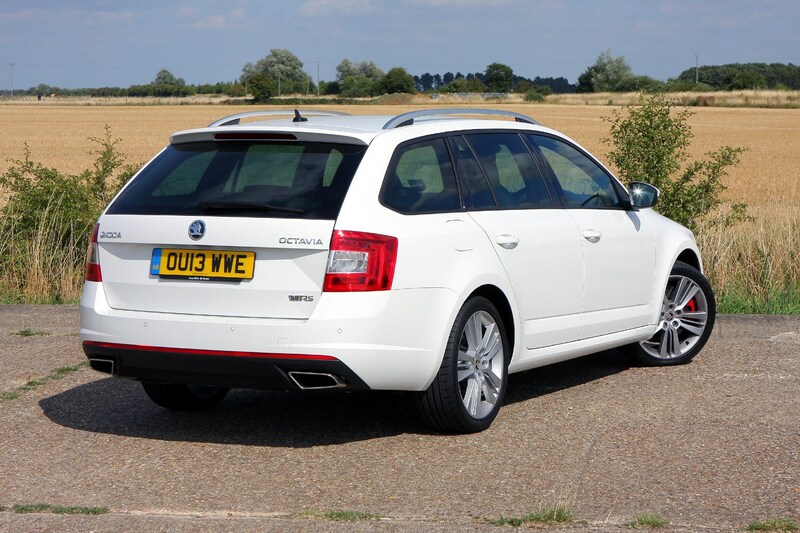 Not only does it have a choice of an excellent petrol engine or an efficient yet fast diesel engine but it’s comfortable, practical and doesn’t look bad either. 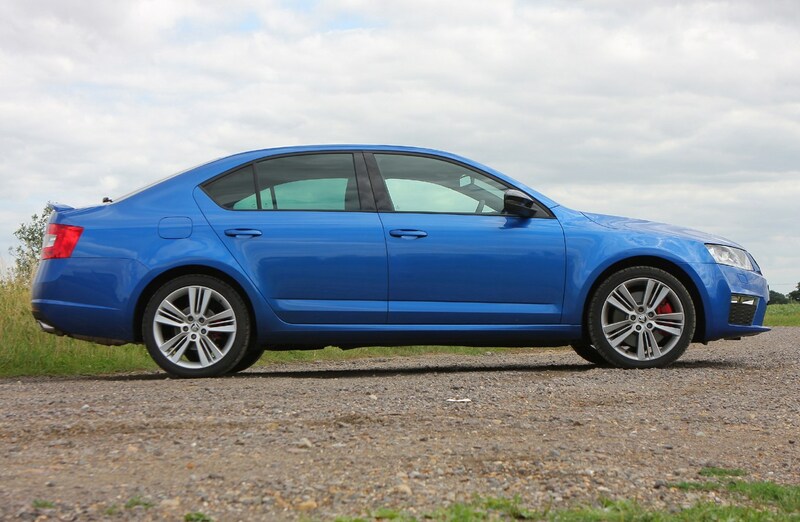 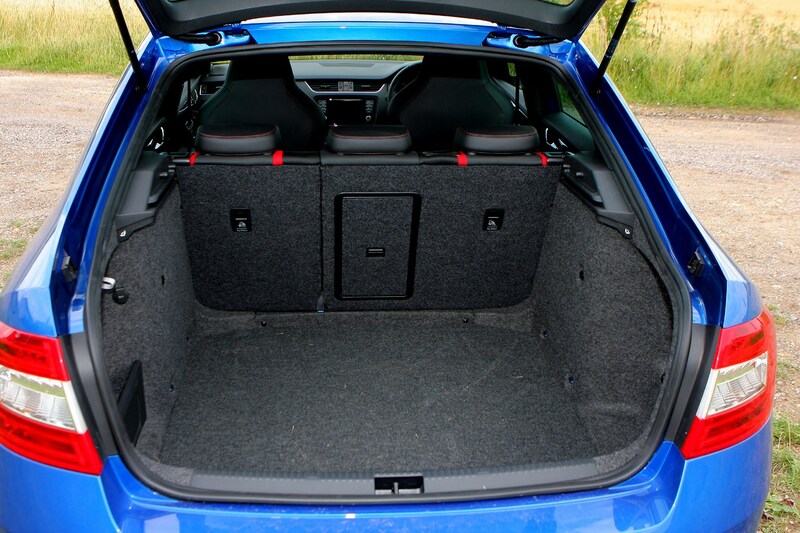 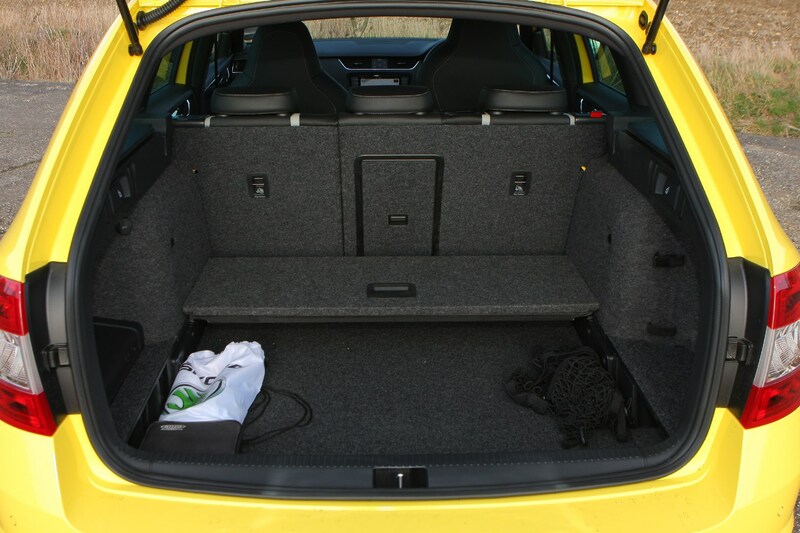 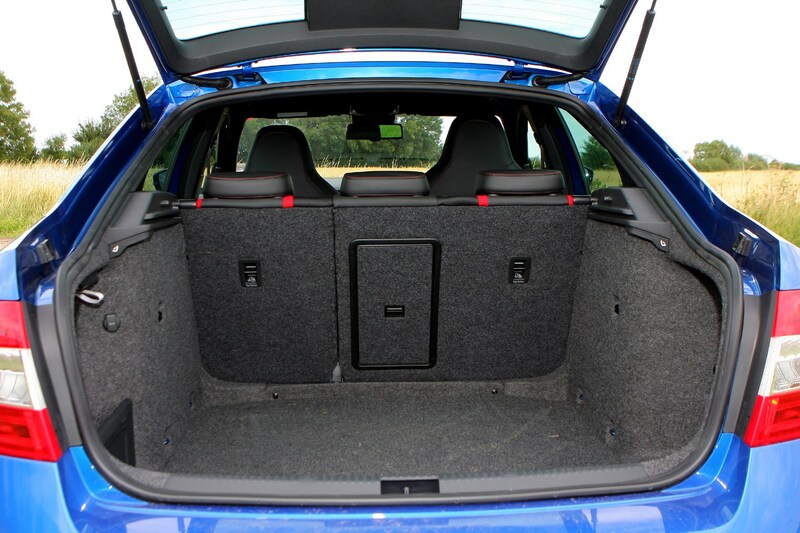 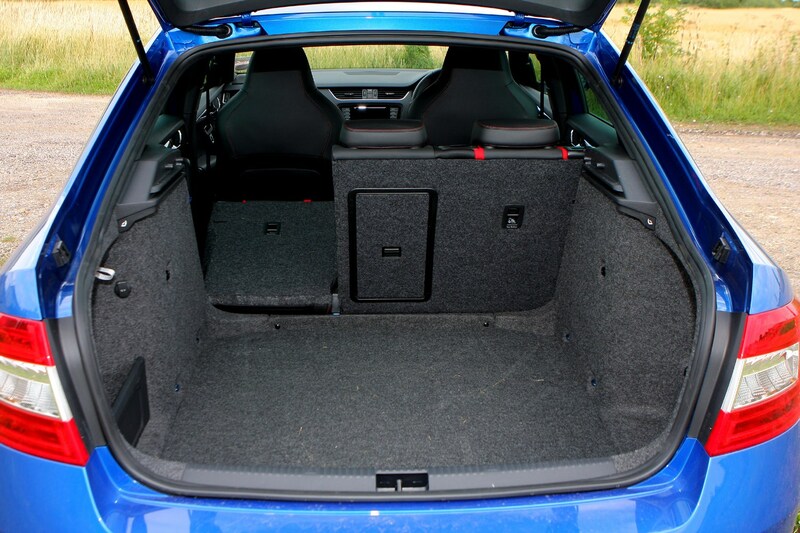 It shares much of its chassis design with the Golf GTi, which means it handles very well too. 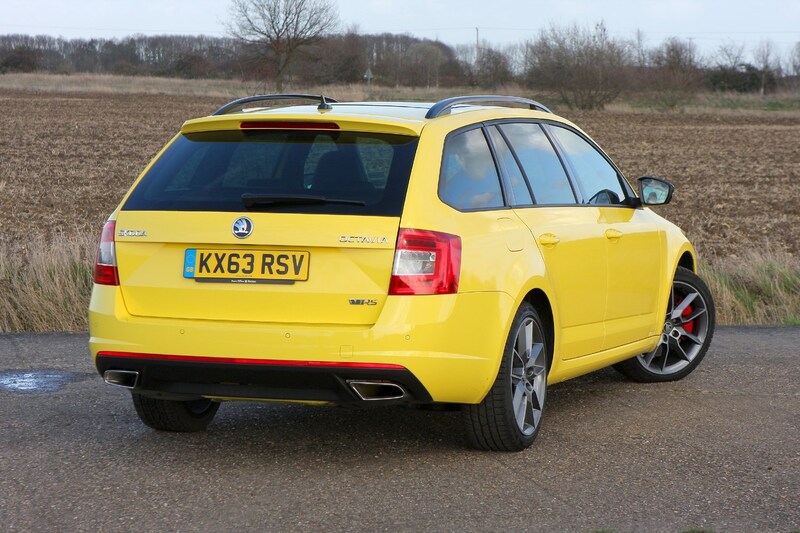 The main problem this car faces is that while the less efficient petrol engine is fantastic to drive, the diesel engine gets lower running costs yet loses some of the vRS’ fun factor. 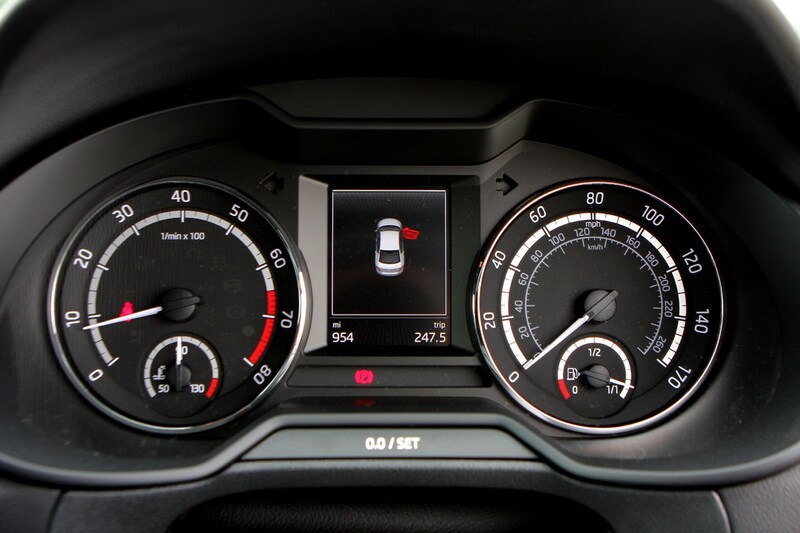 That’s not to say it’s slow, but driving both cars back-to-back it’s clear which one is the better driver’s car. 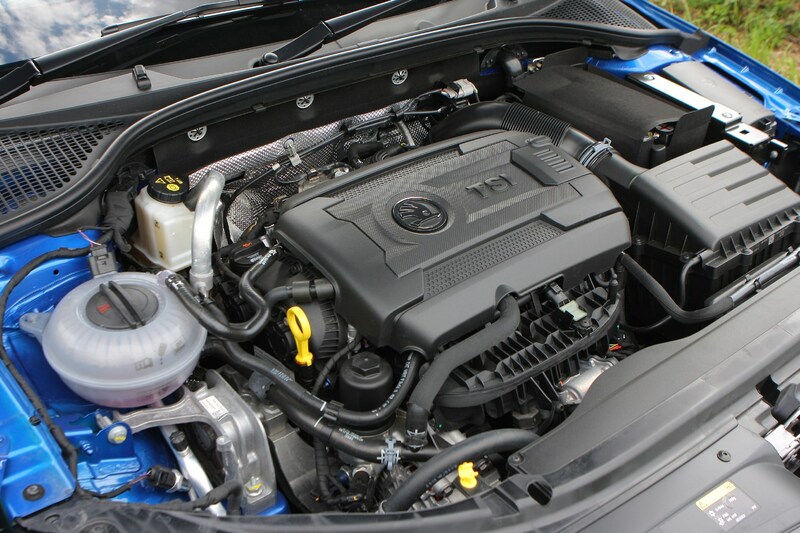 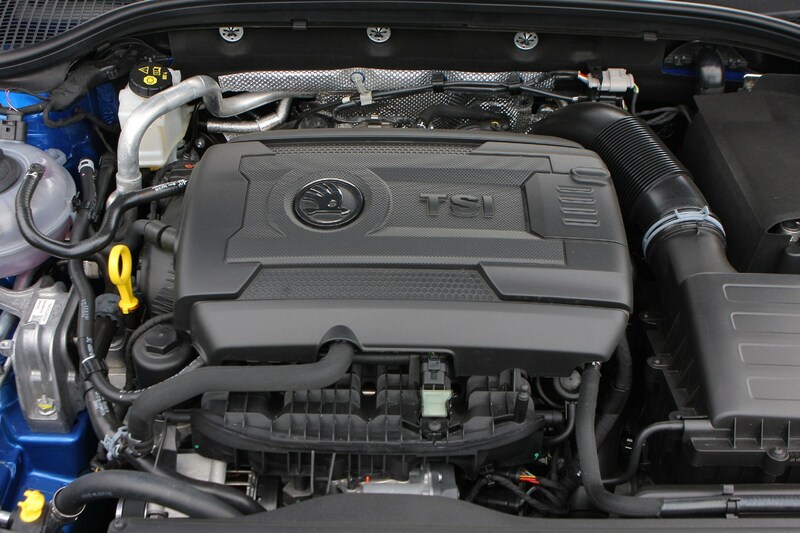 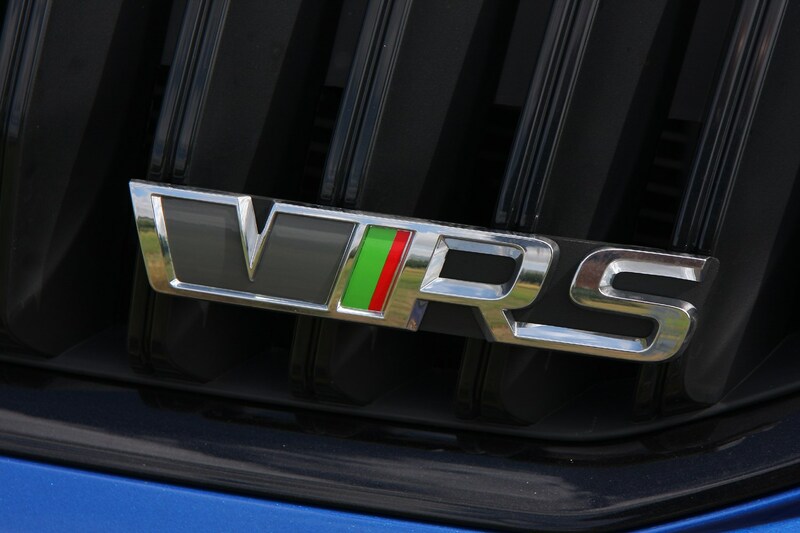 There are two engines available to power the vRS. 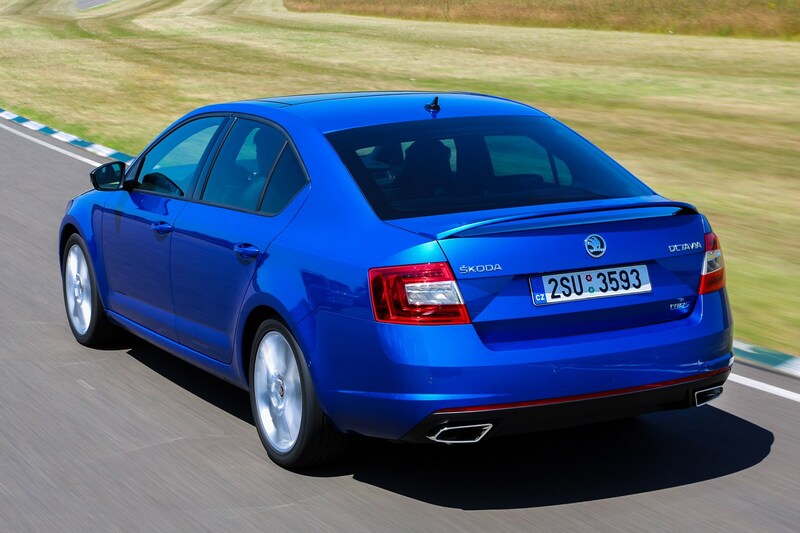 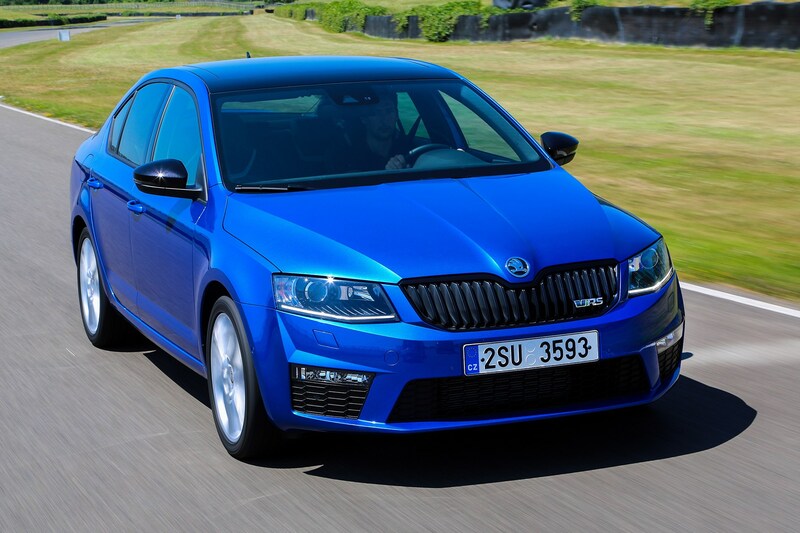 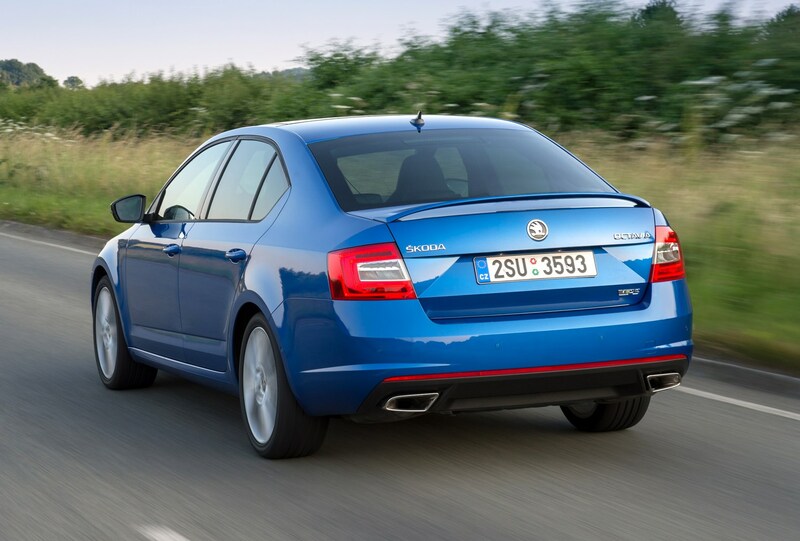 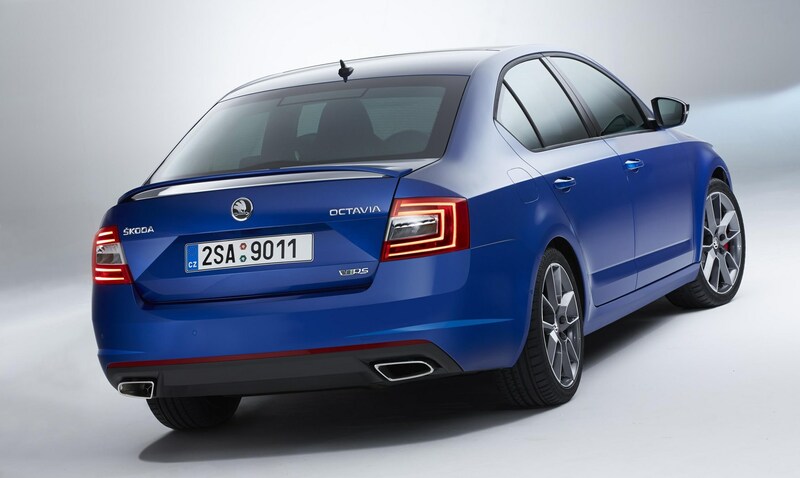 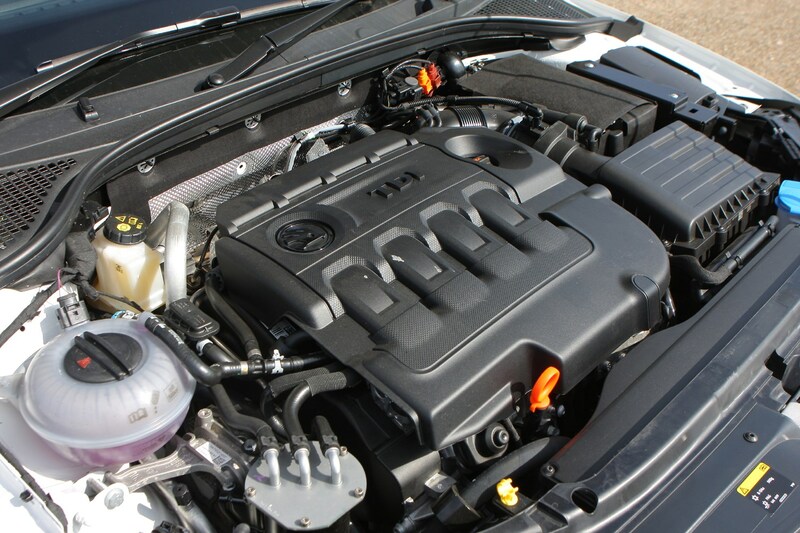 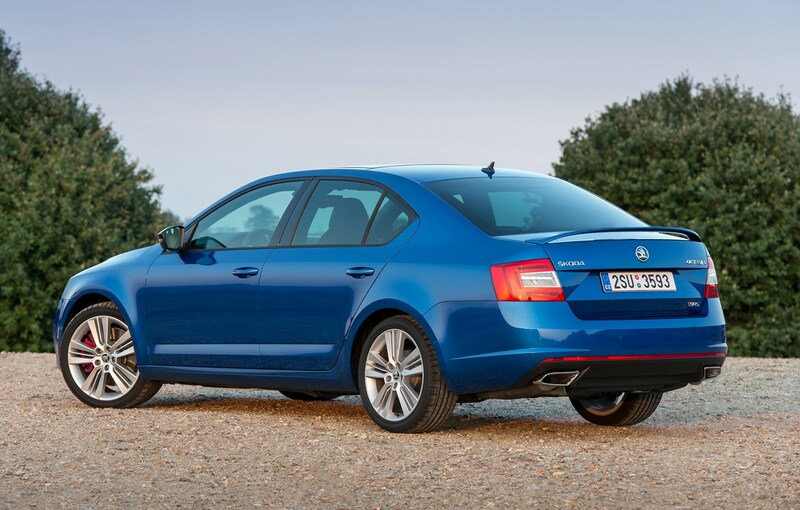 The first is a 2.0-litre petrol engine which makes 218bhp and will power the Octavia to 62mph in 6.8 seconds. 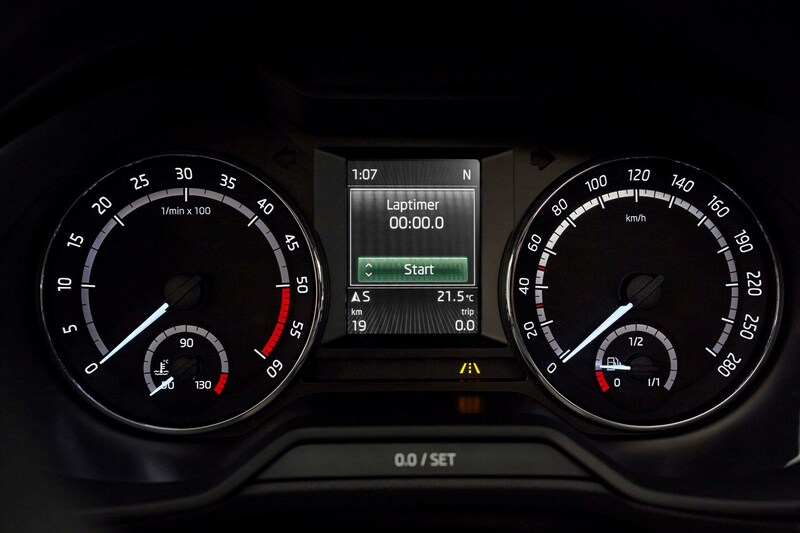 Secondly there’s a 2.0-litre diesel engine which means a sprint to 62mph in 8.1 seconds and a top speed of 144mph. 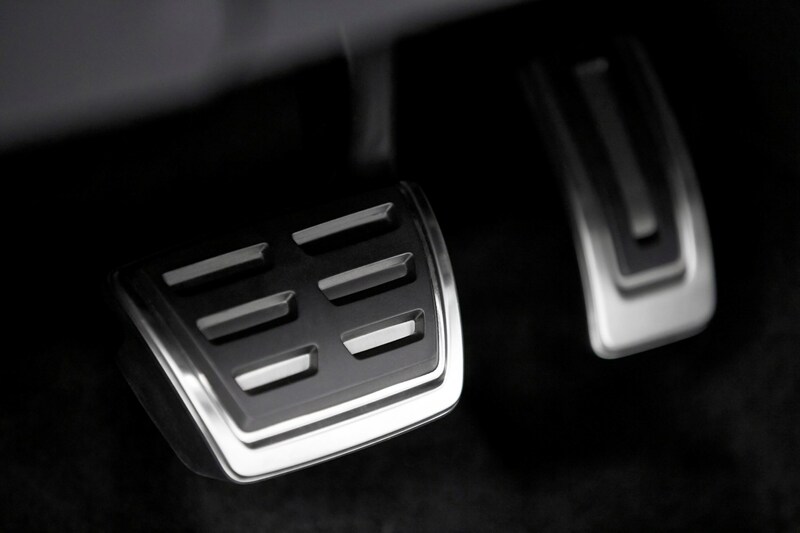 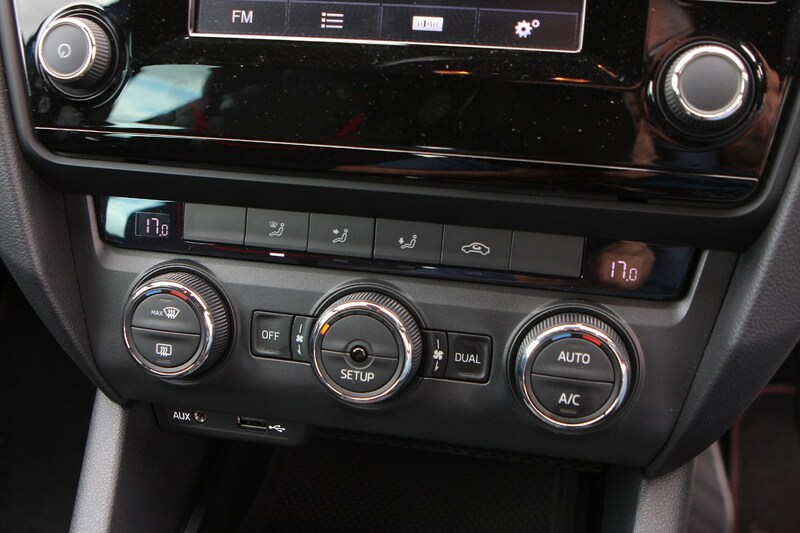 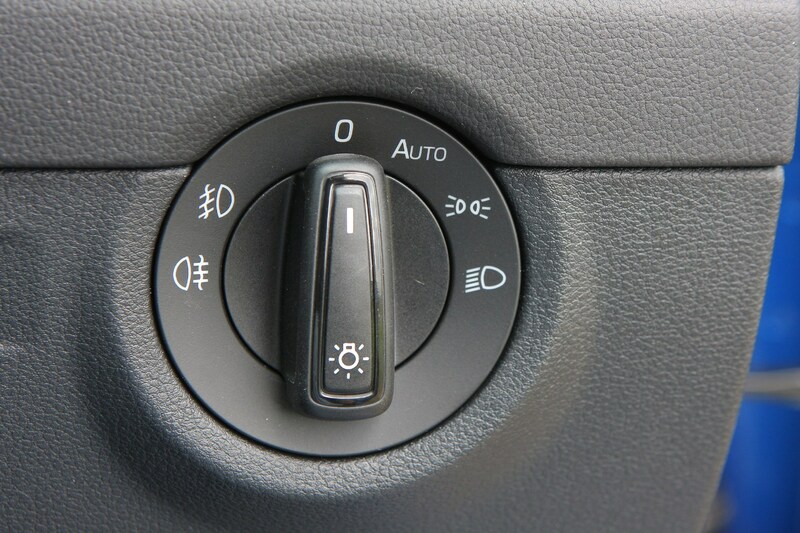 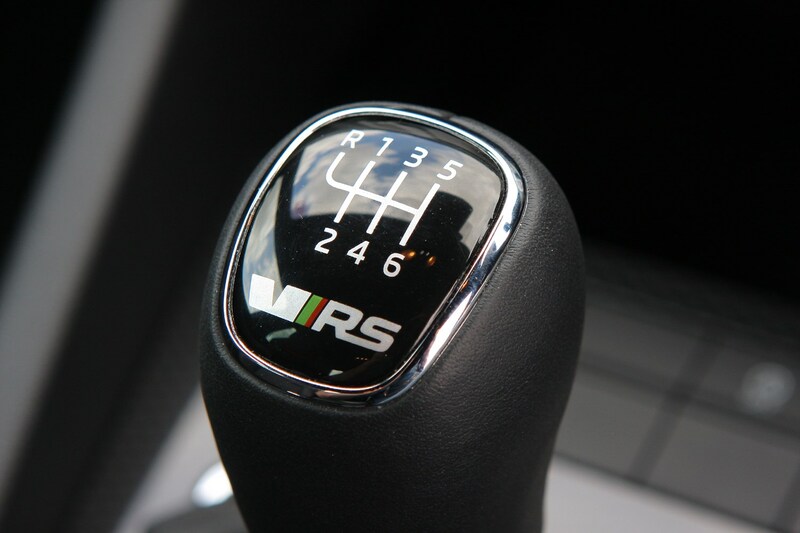 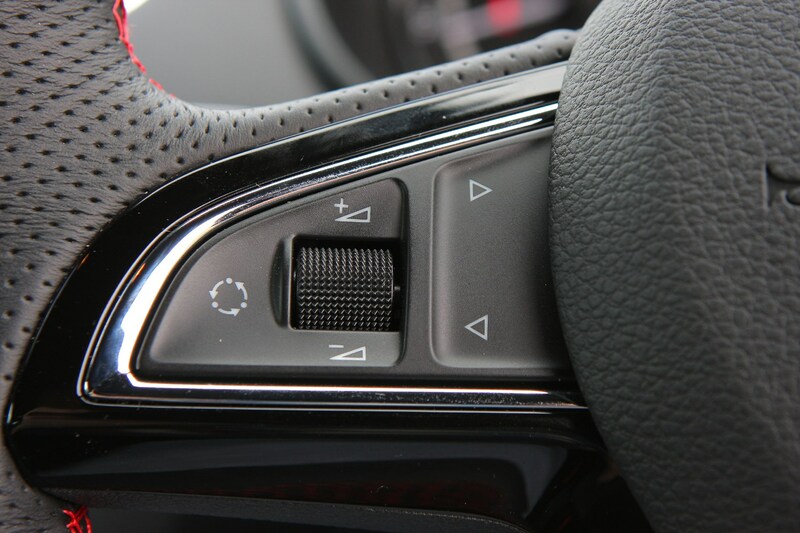 There are two gearbox options: a conventional manual ’box or a twin-clutch automatic, both with six speeds. 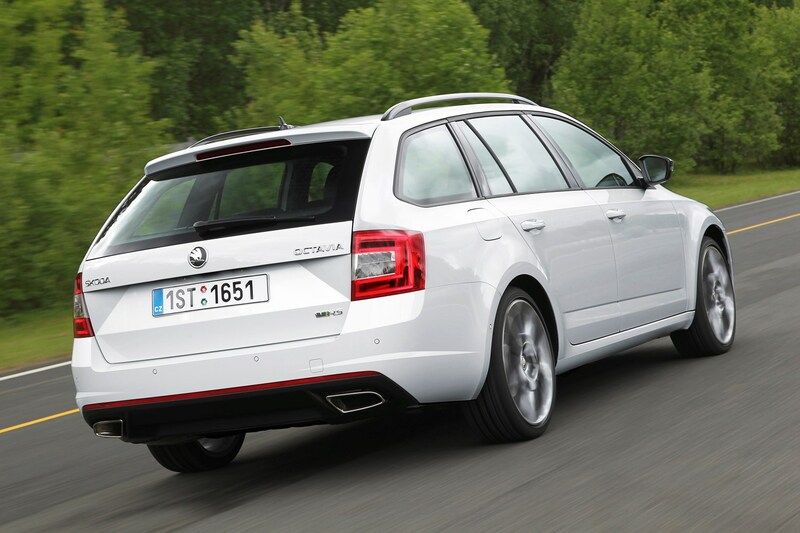 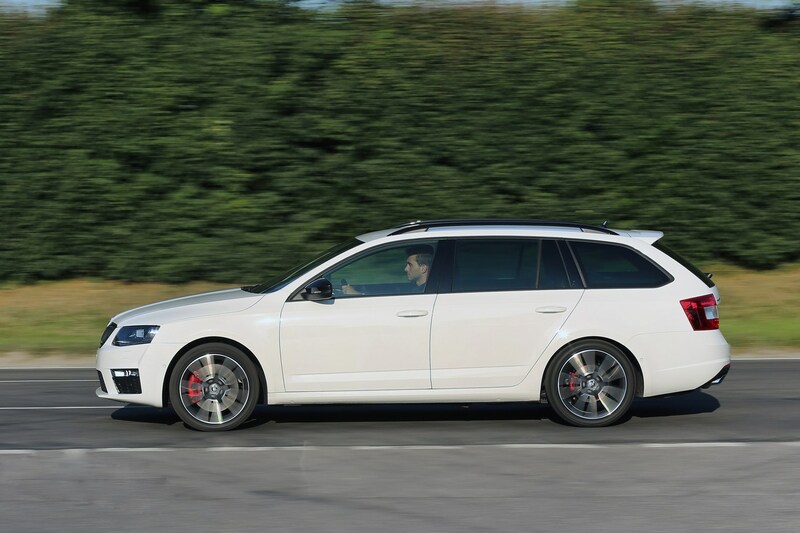 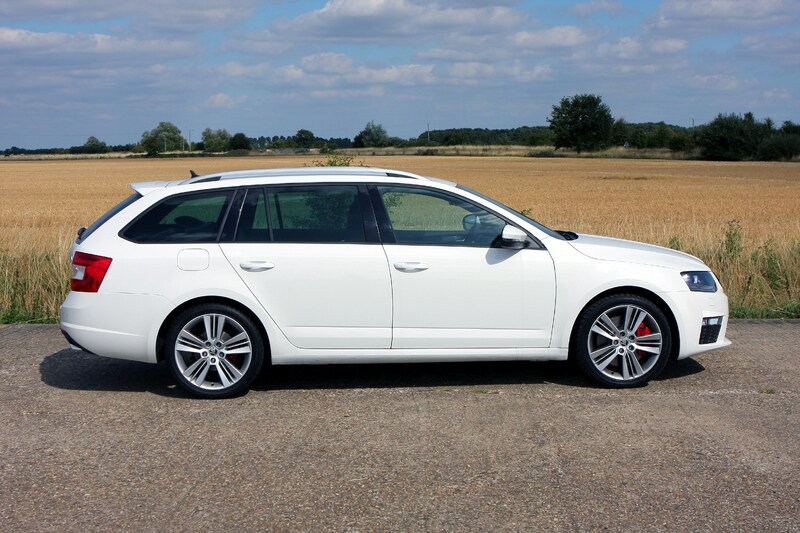 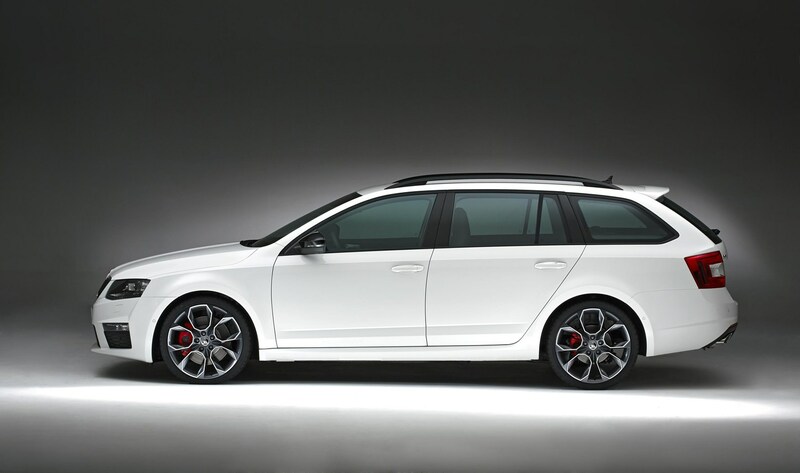 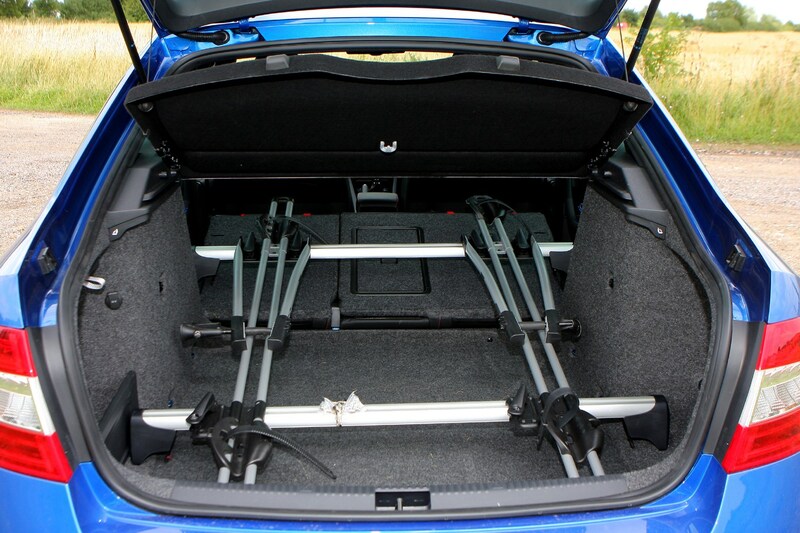 Sports suspension comes as standard, with a ride height drop of 12mm over the standard Octavia (13mm for the estate model). 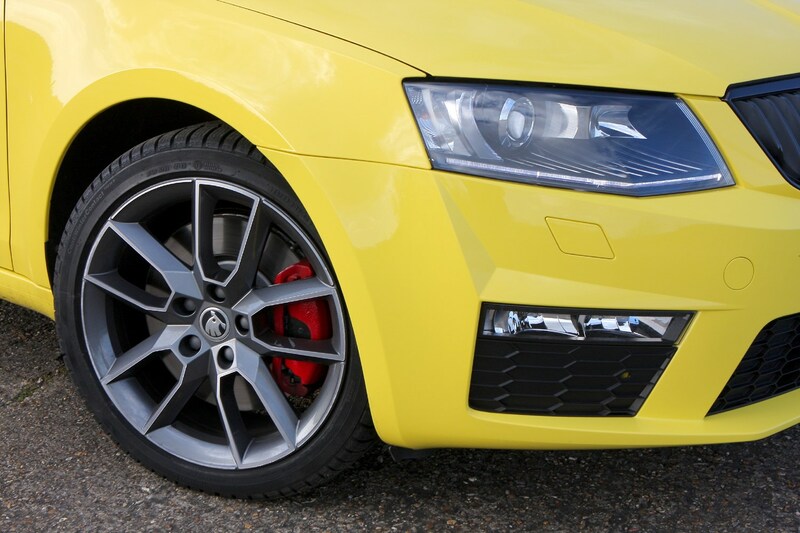 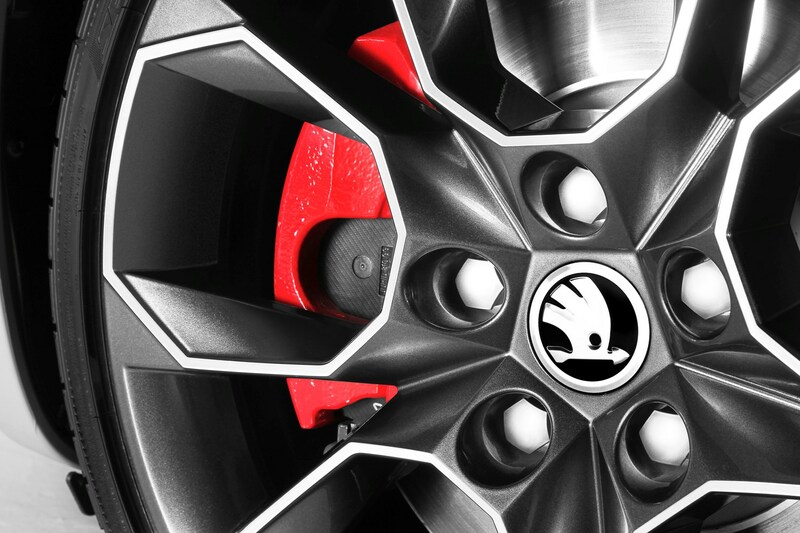 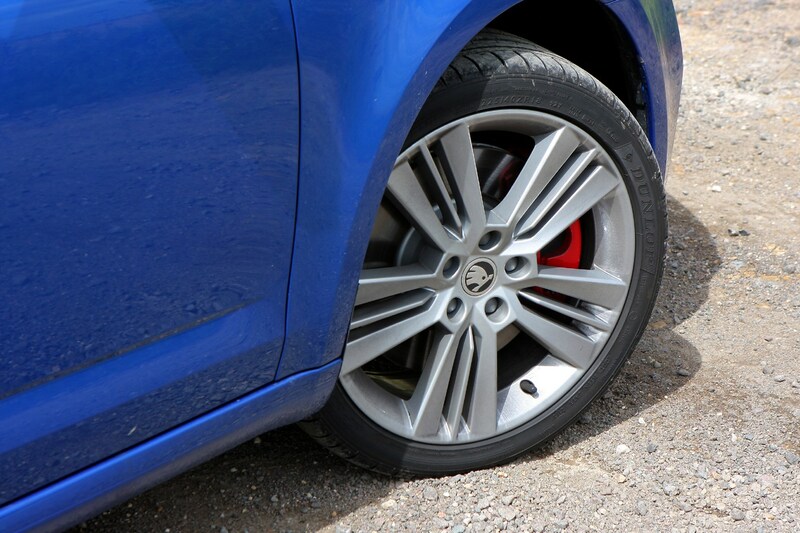 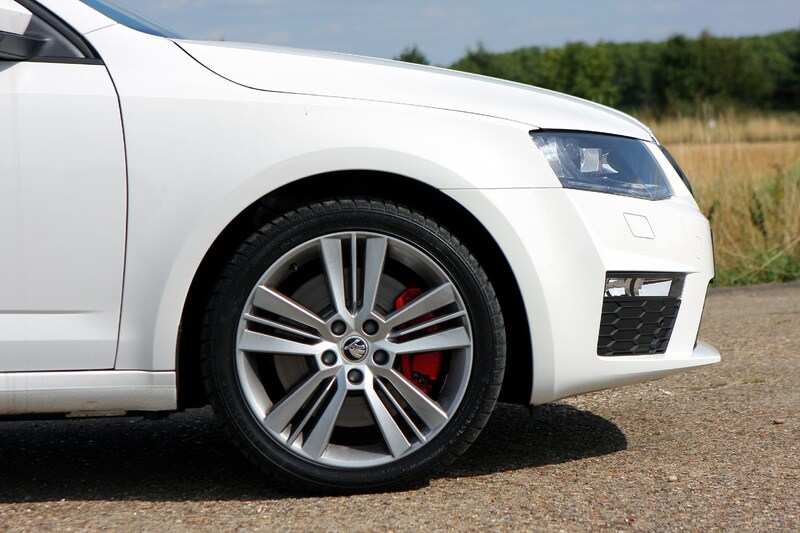 In terms of styling, there are red brake calipers hidden behind a choice of 17, 18 or 19-inch alloy wheels. 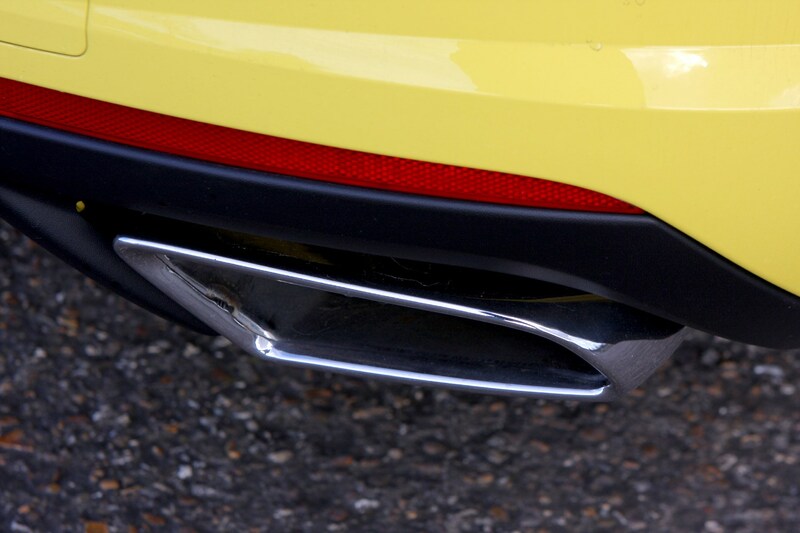 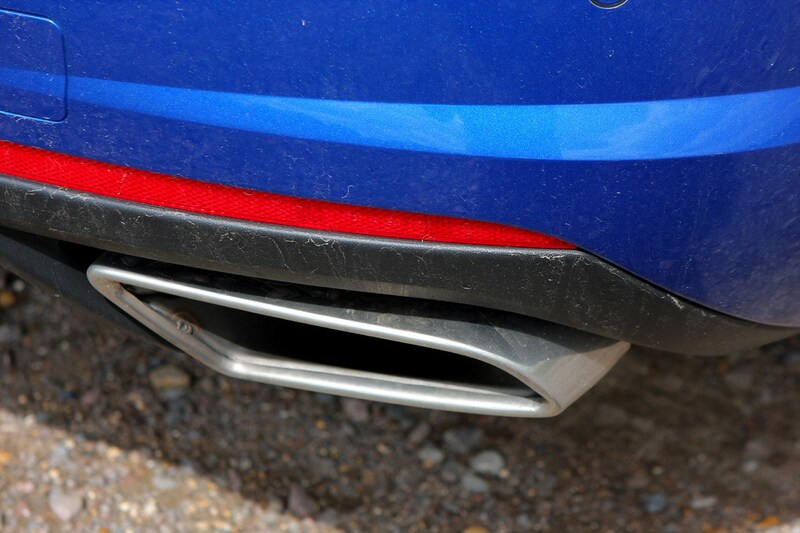 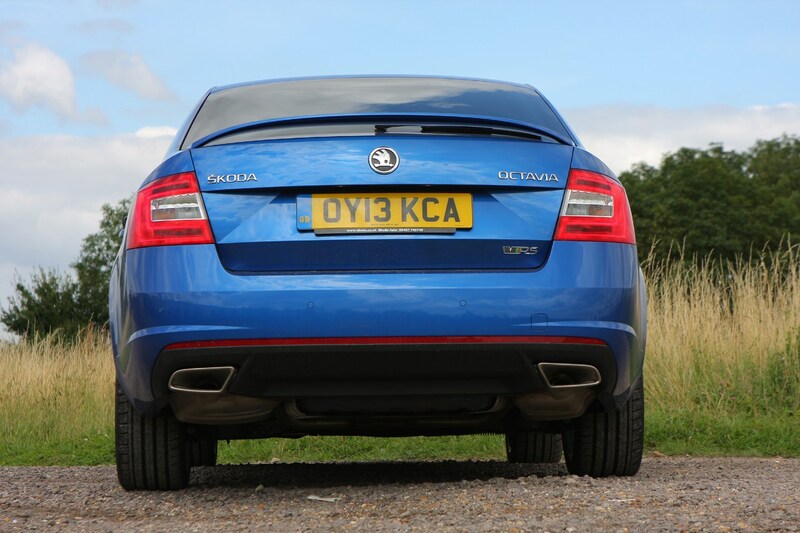 There’s a sporty vRS bodykit and two large exhaust pipes at the rear of the car. 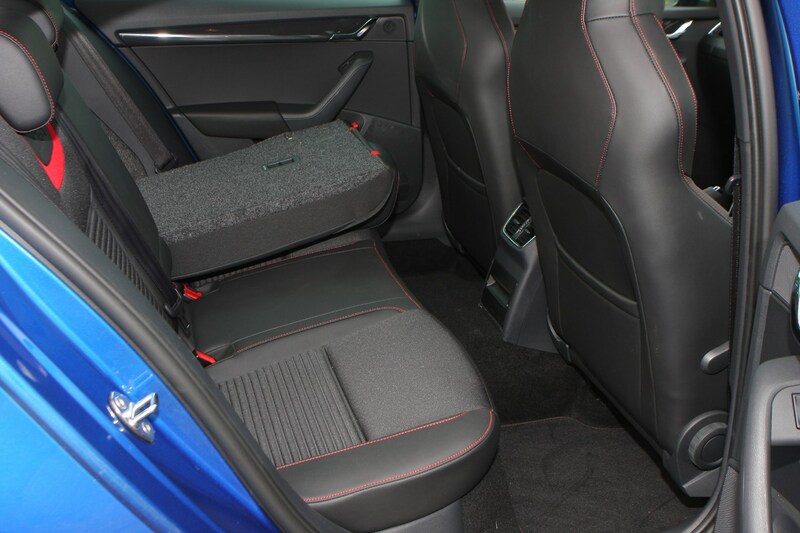 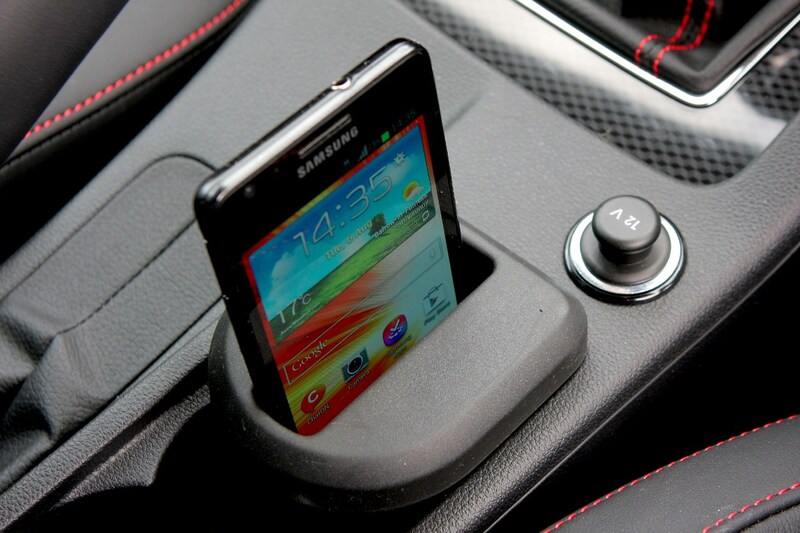 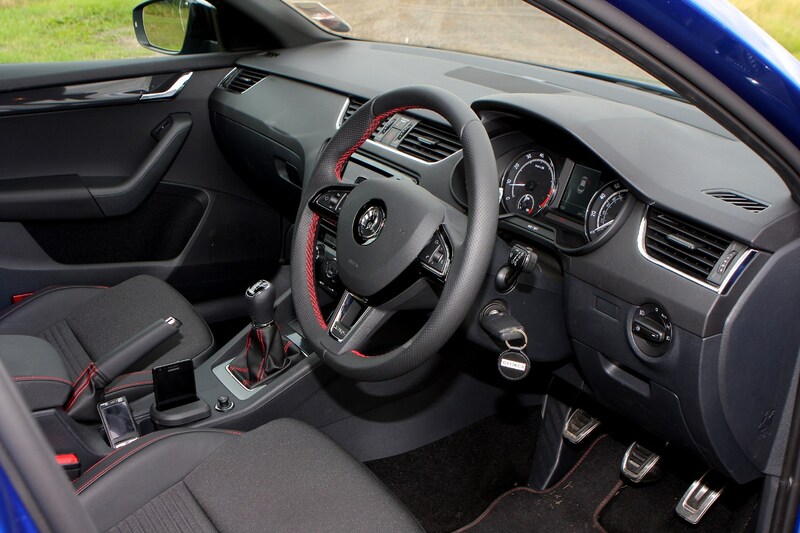 You can also expect a sporty interior featuring supportive leather seats and a special steering wheel. 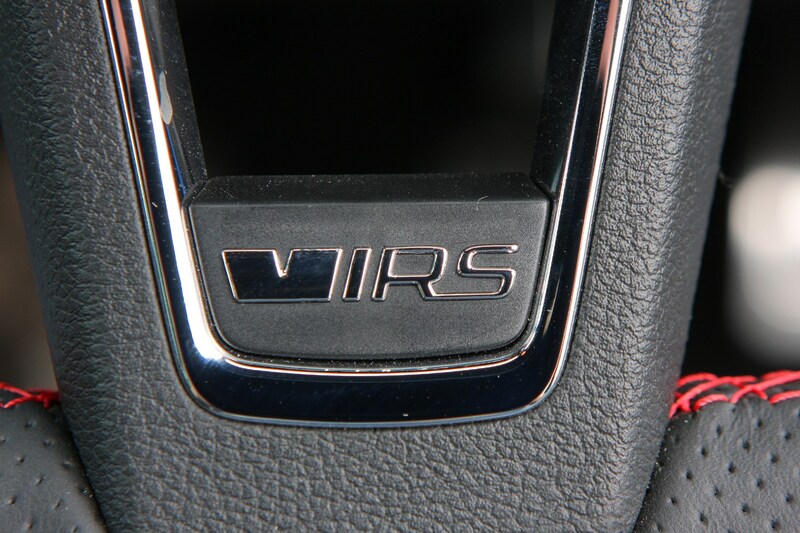 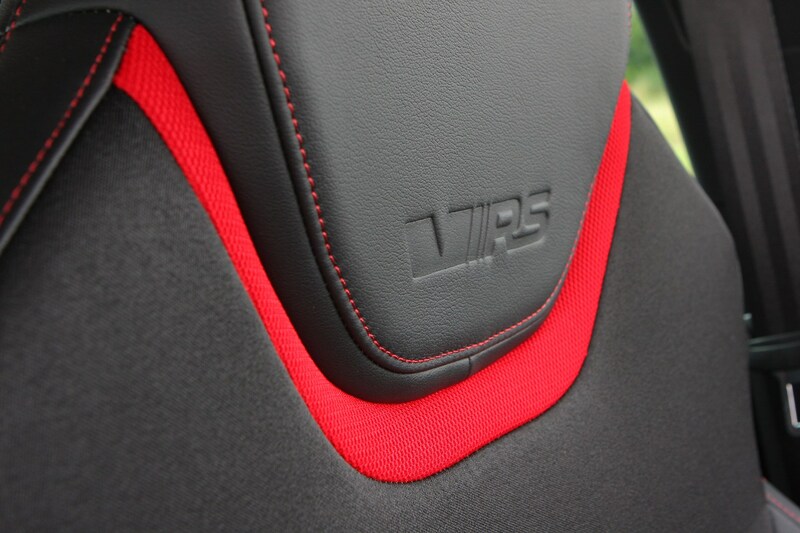 There’s also a liberal smattering of vRS logos all over the car’s interior. 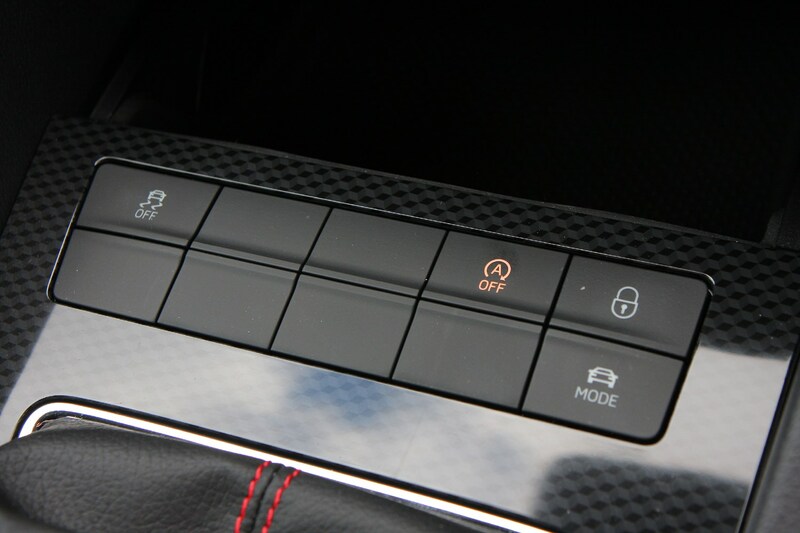 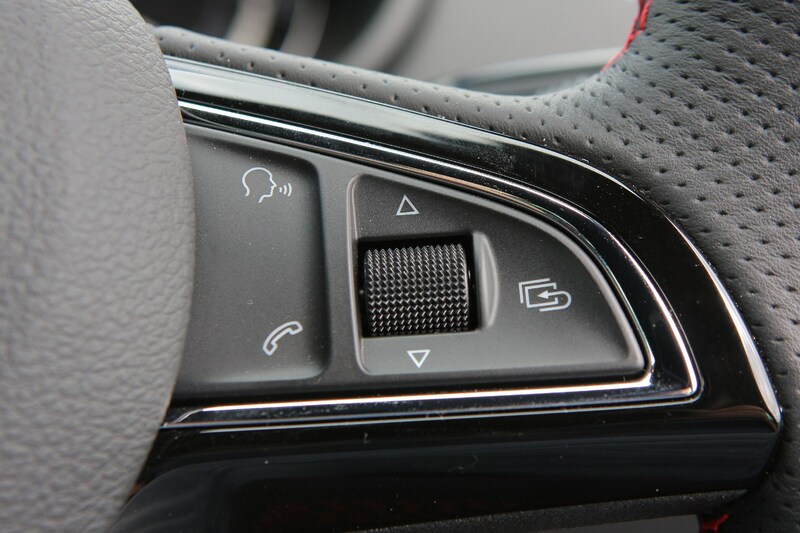 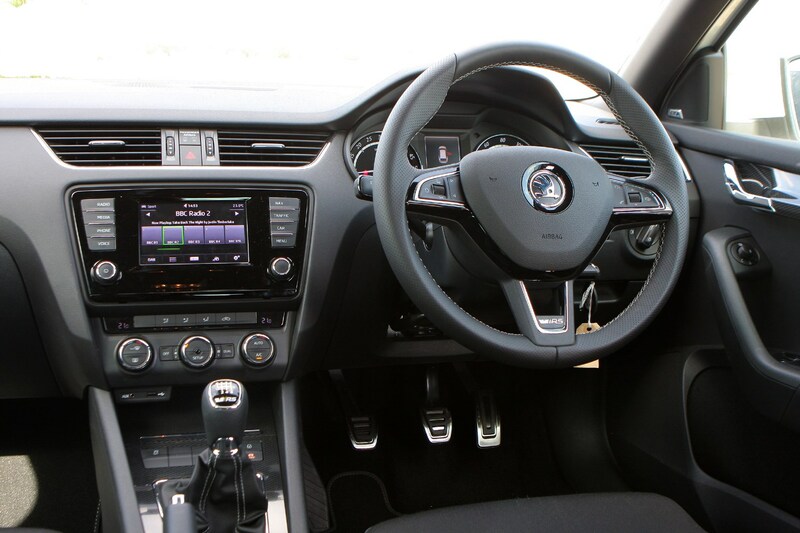 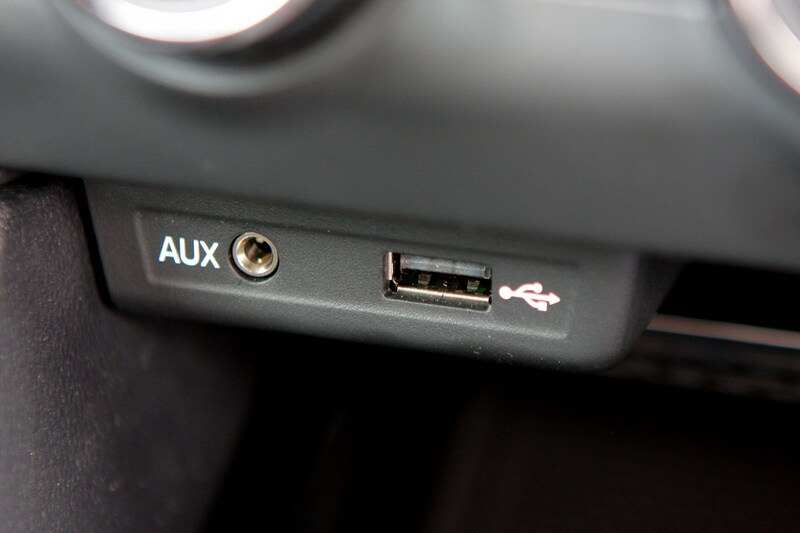 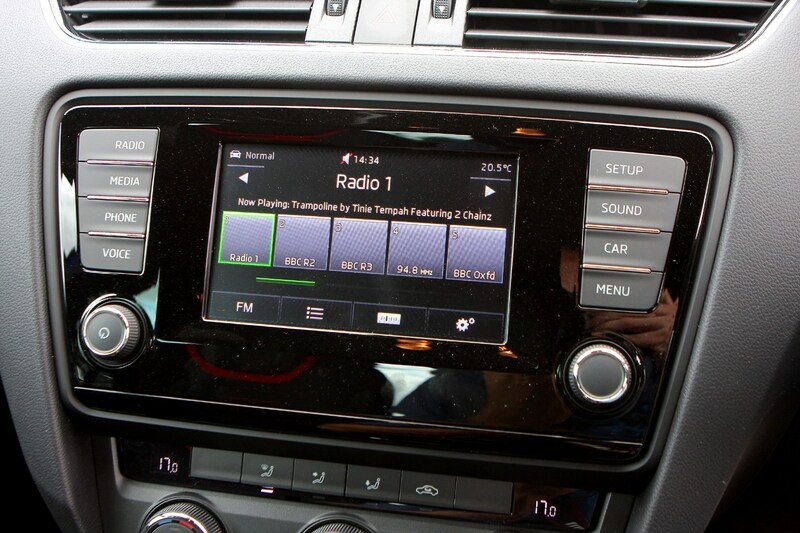 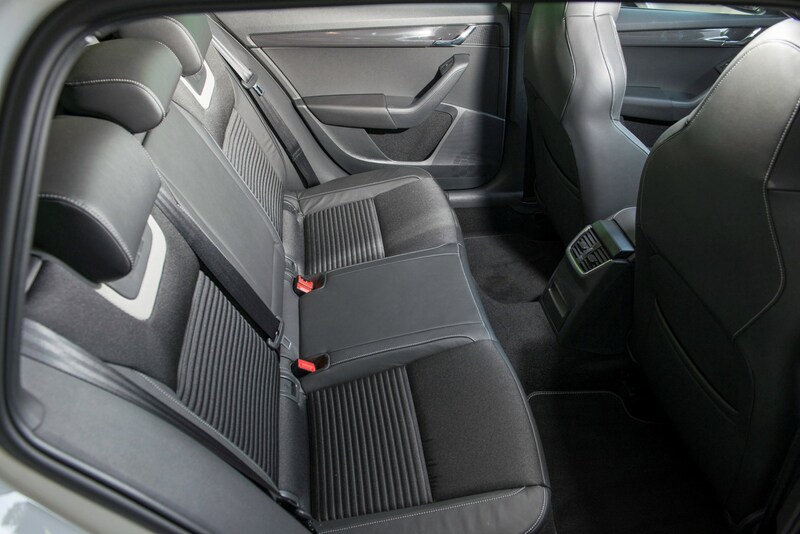 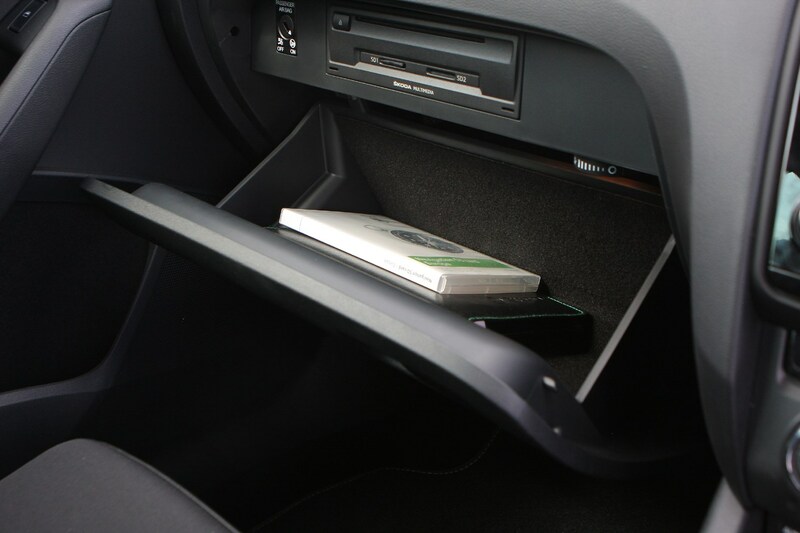 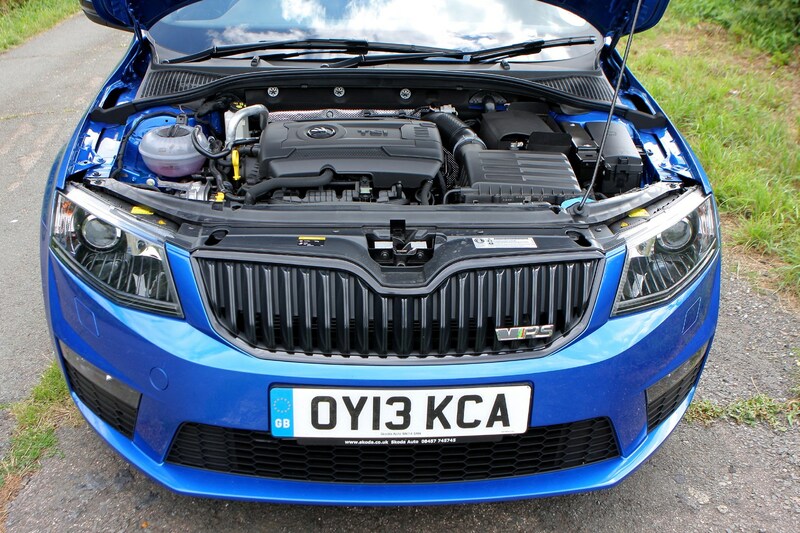 As is now the norm on Skoda cars, you can expect ‘Simply Clever’ interior features installed to make life easier. 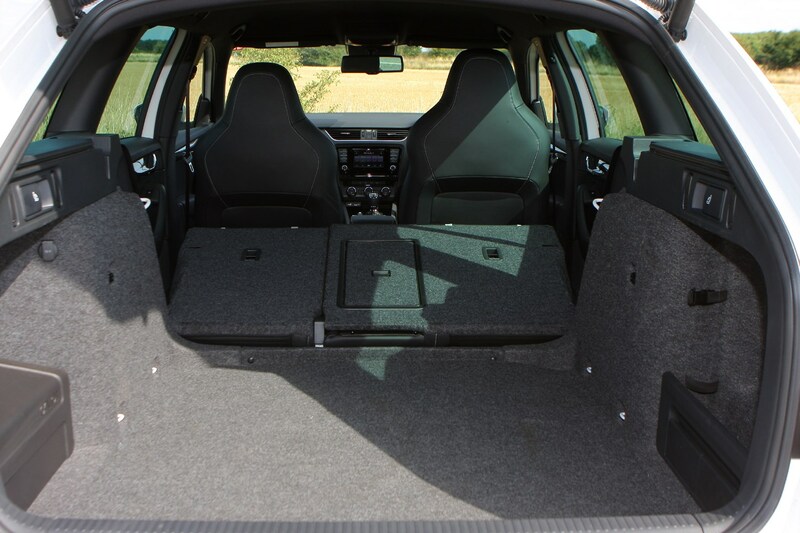 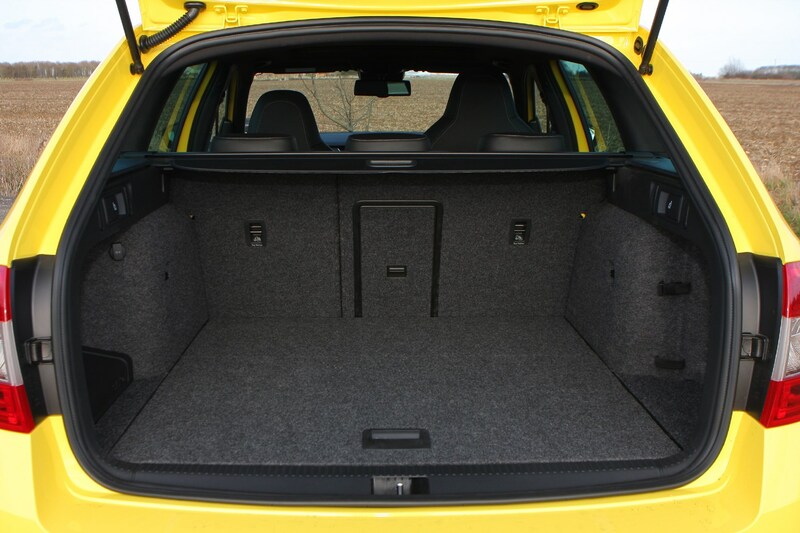 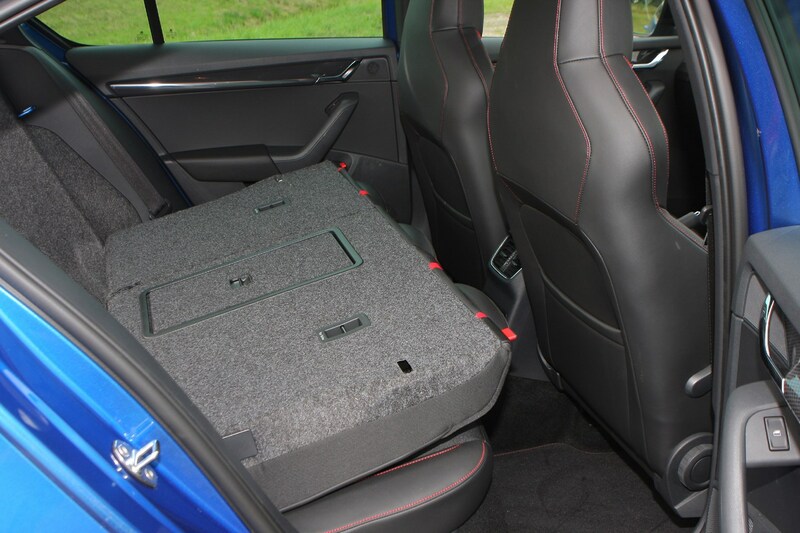 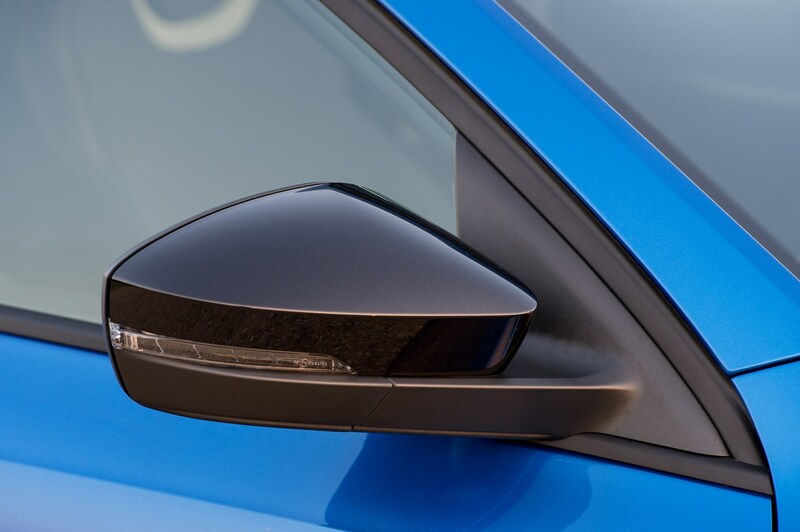 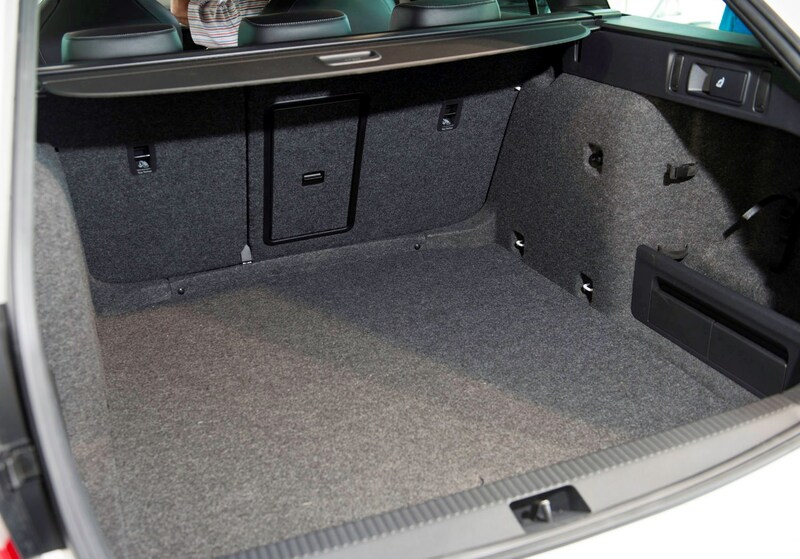 These include an ice scraper on the fuel filler cap, a double-sided boot floor and of course storage compartments, cup holders and boot hooks for your shopping. 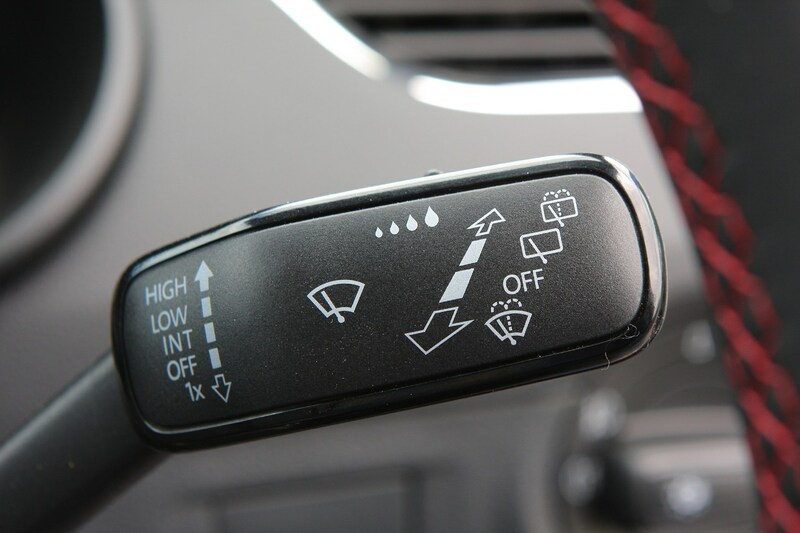 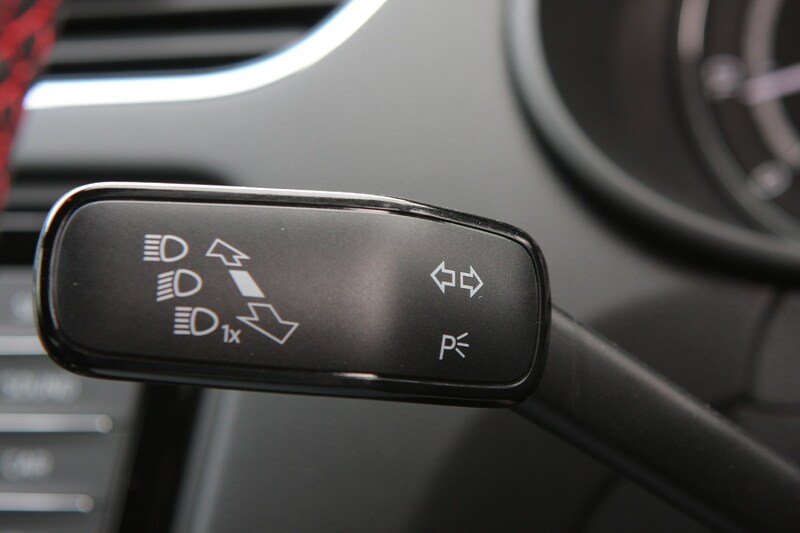 There are myriad safety systems too, with the option of specifying things like adaptive cruise control, automatic headlights and an automatic parking assistant for a little extra cash. 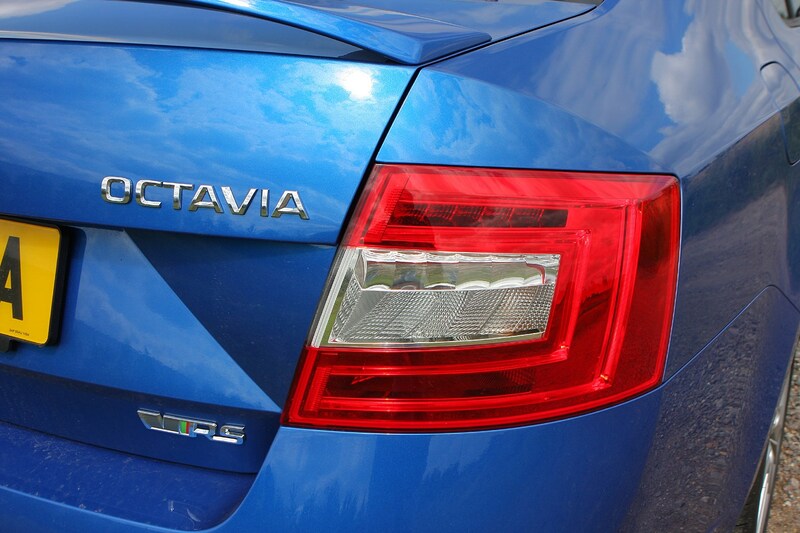 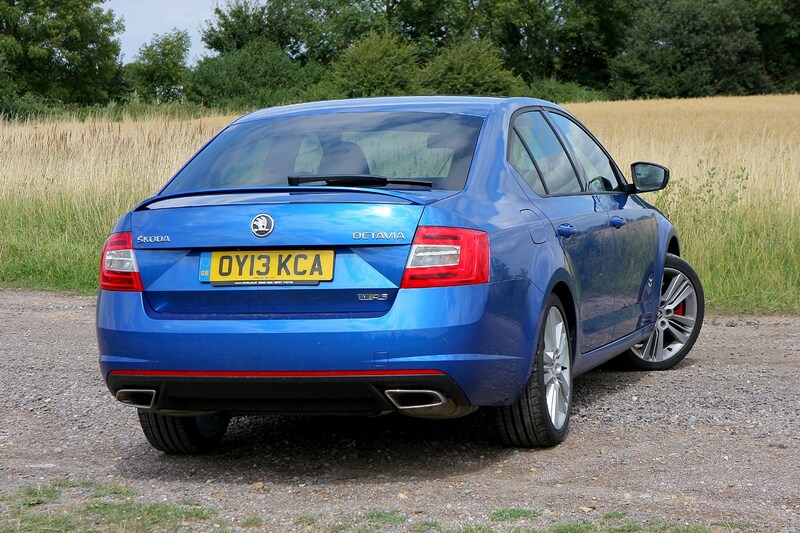 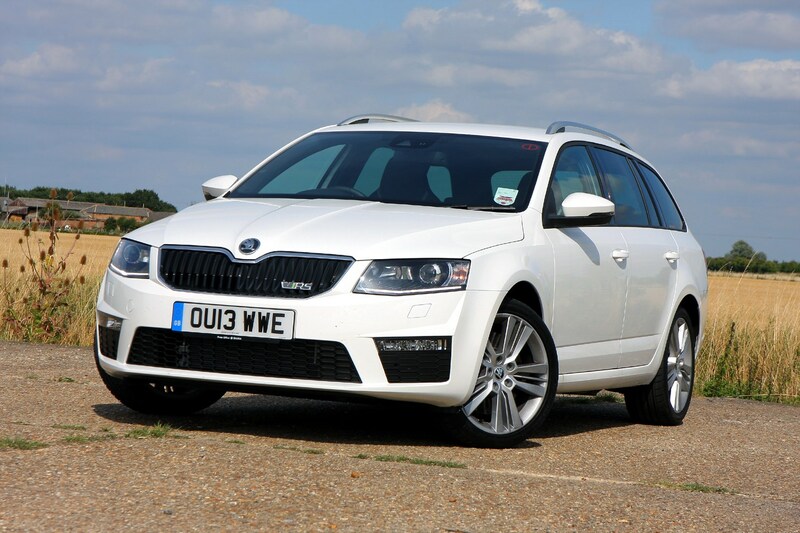 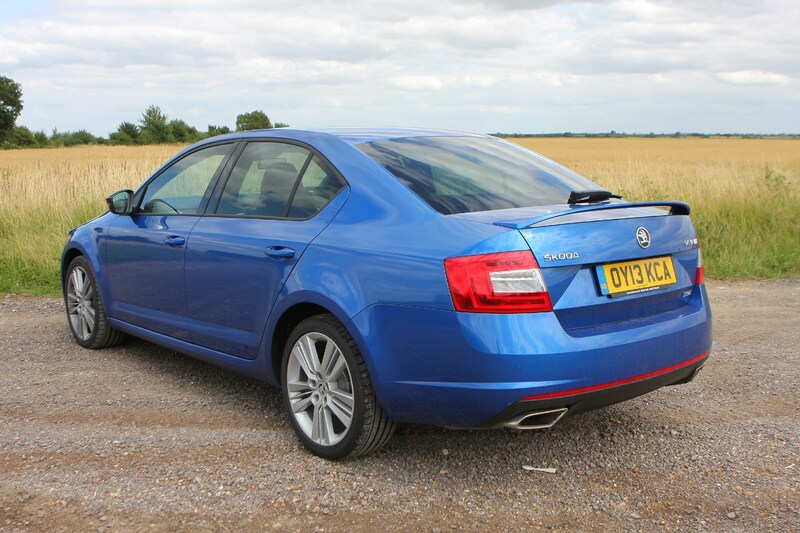 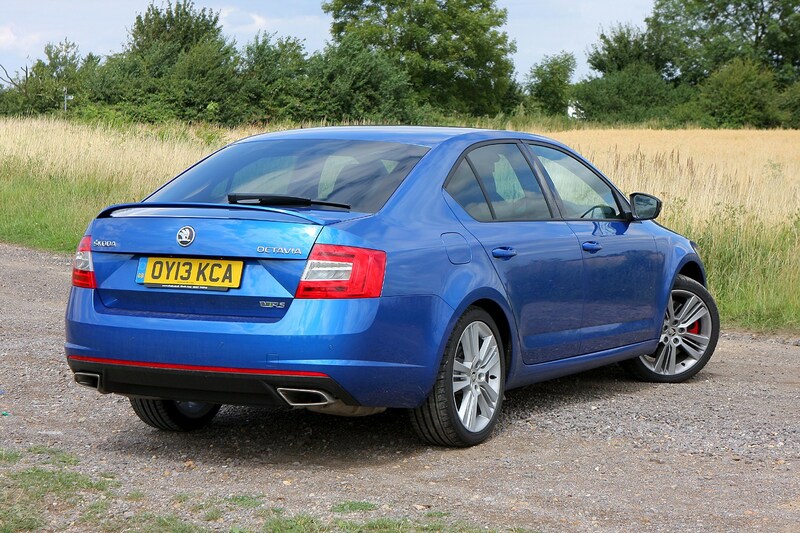 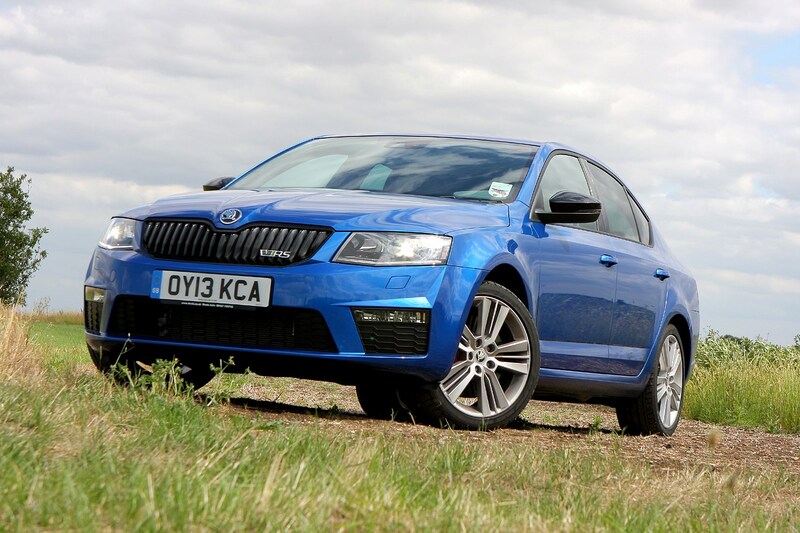 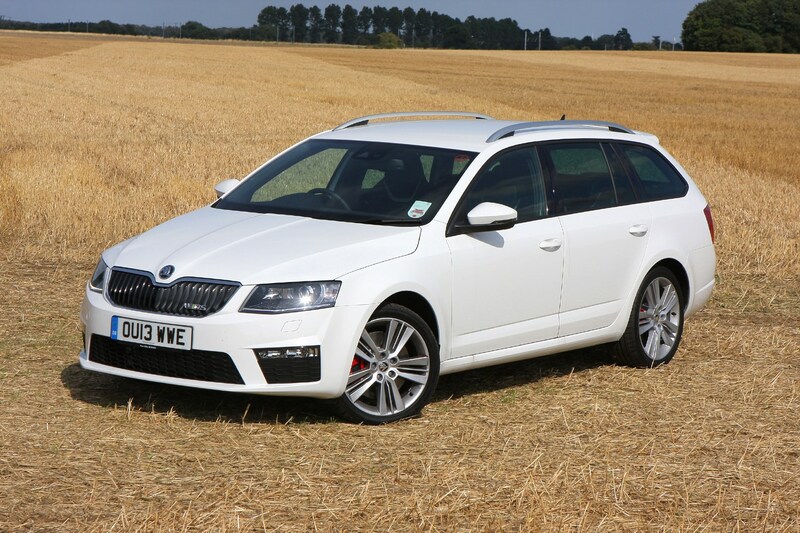 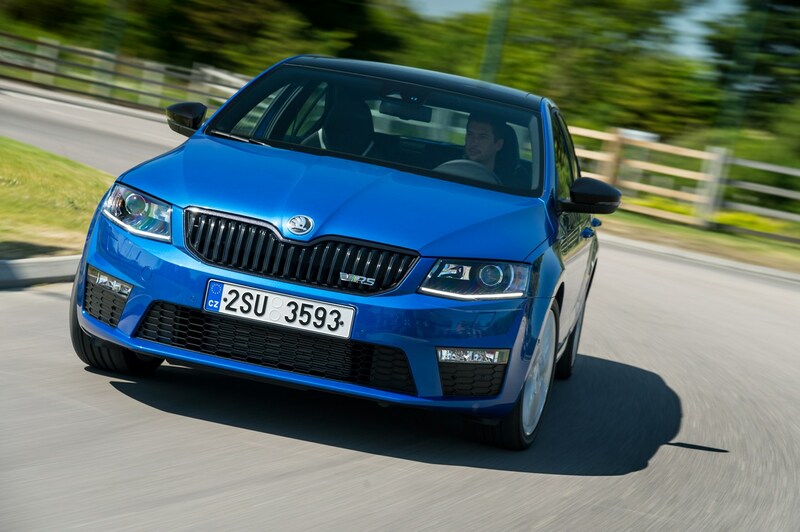 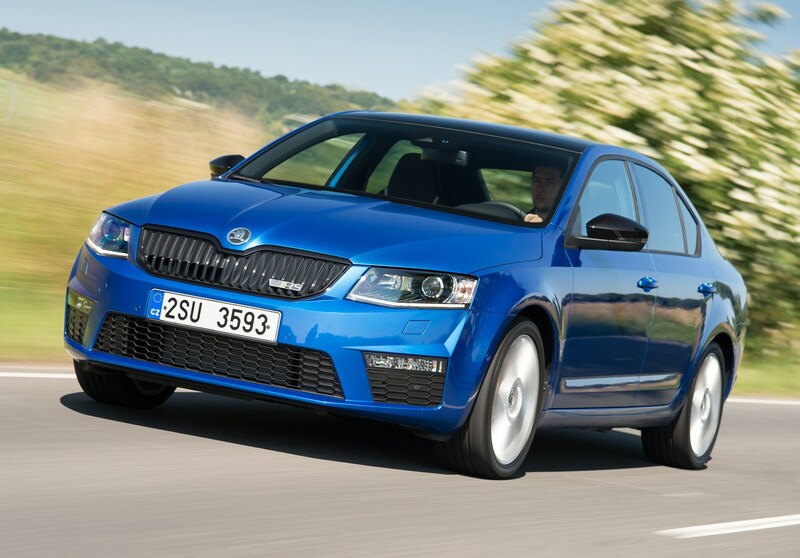 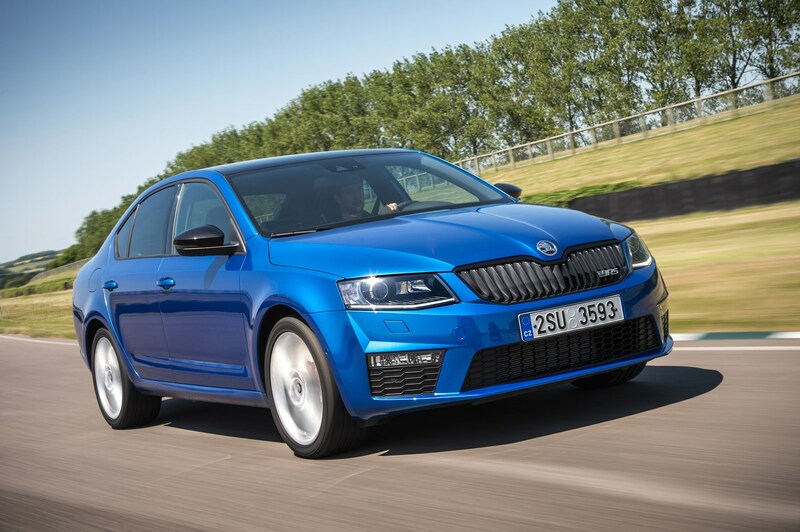 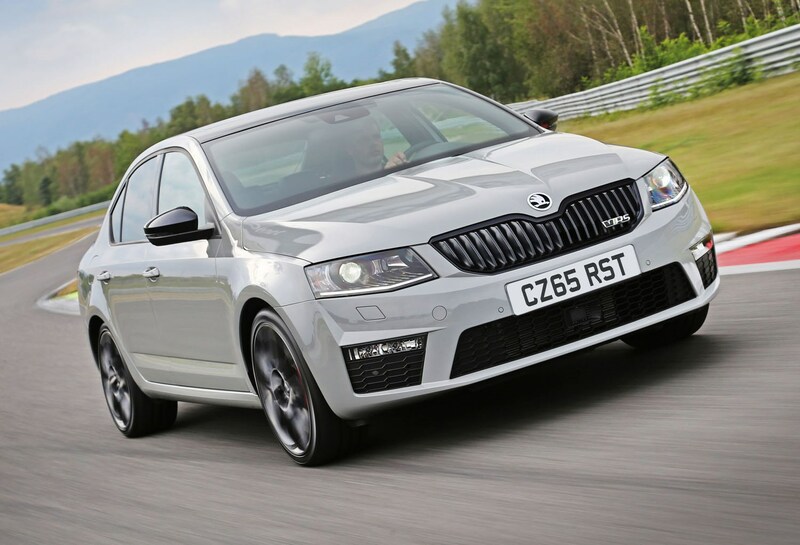 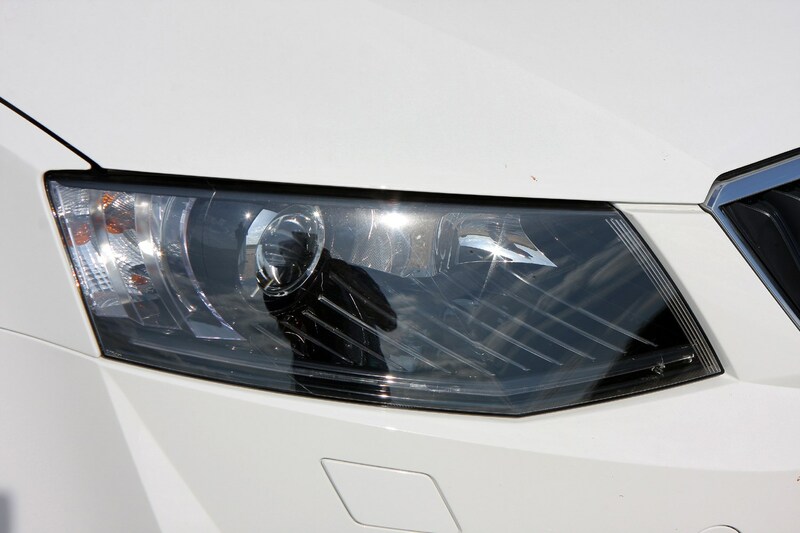 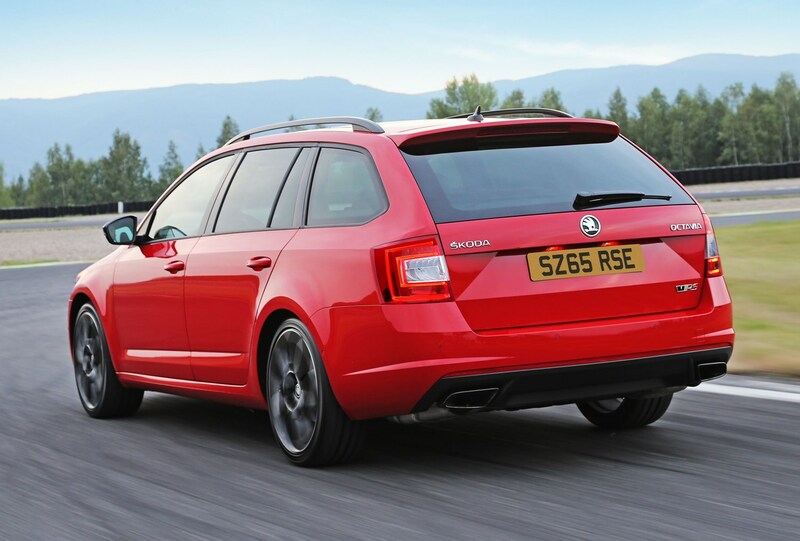 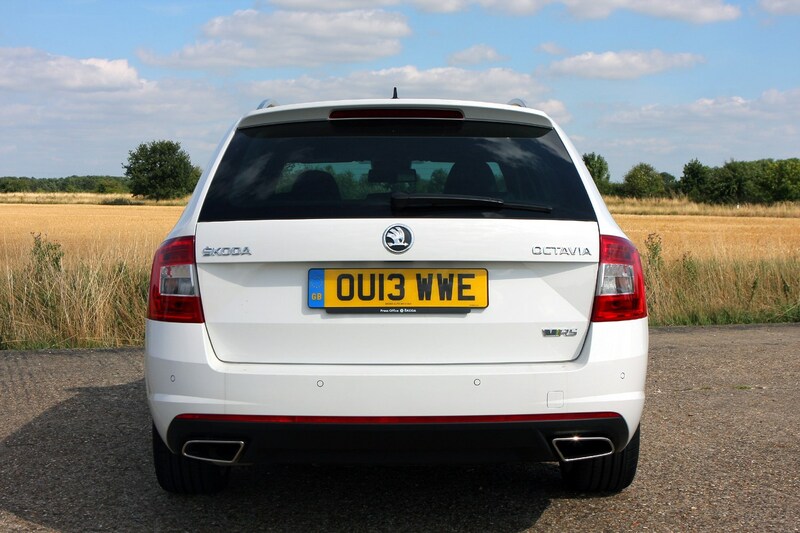 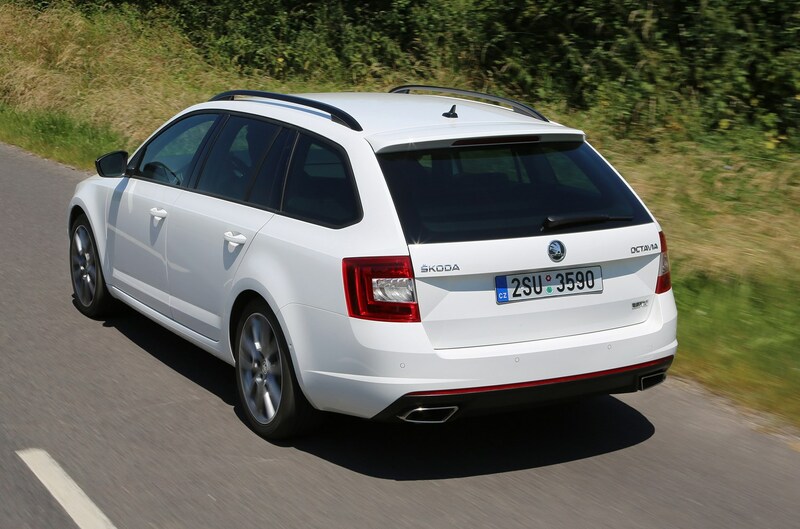 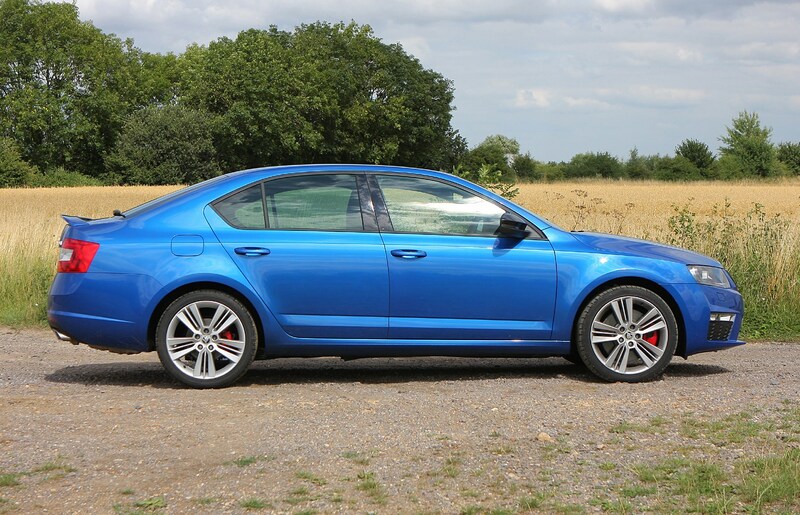 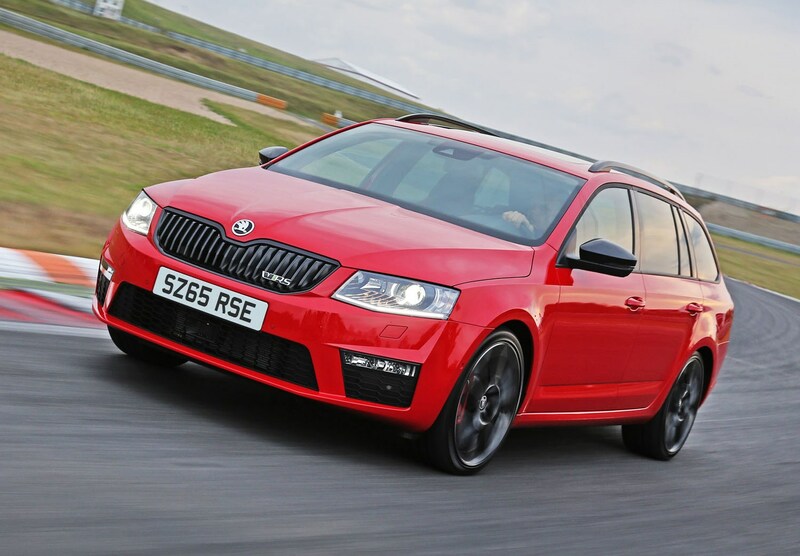 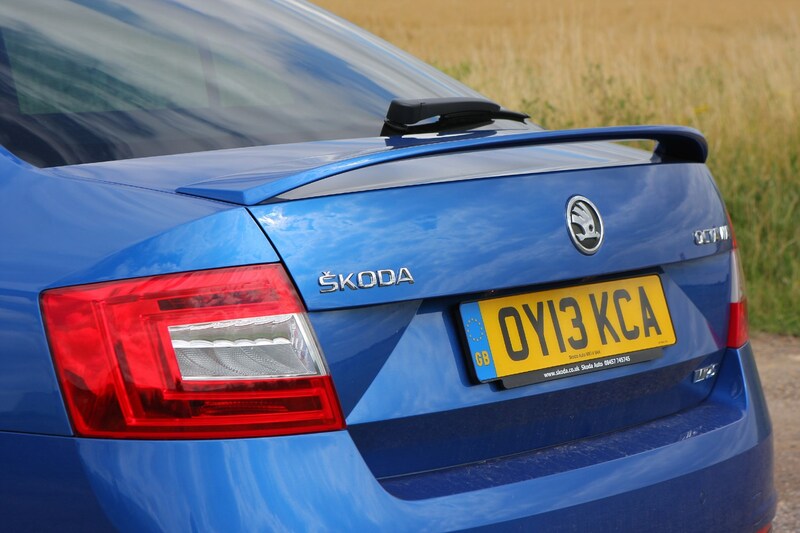 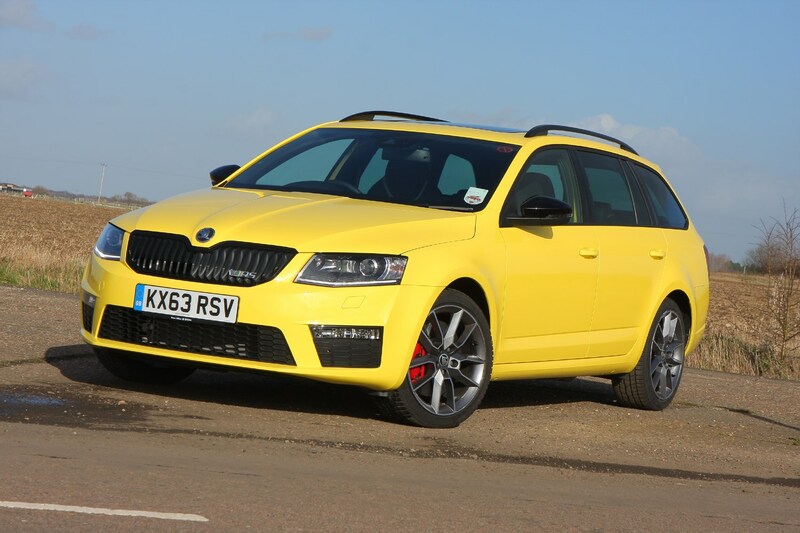 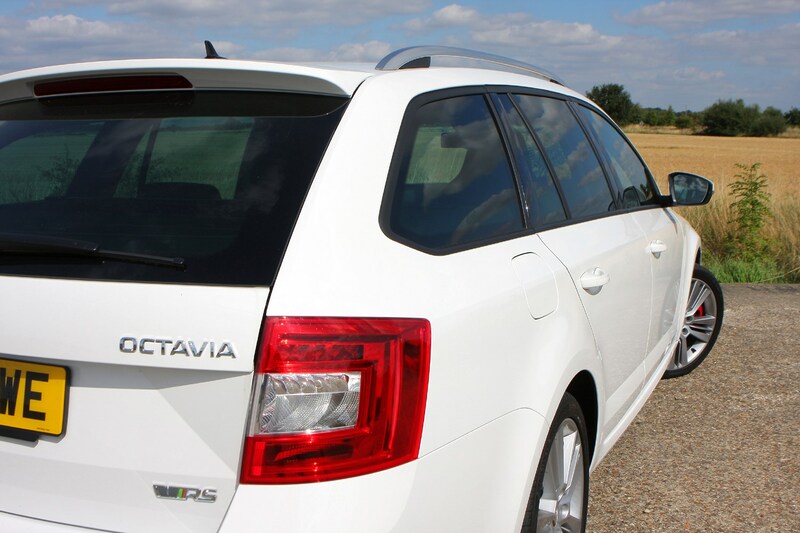 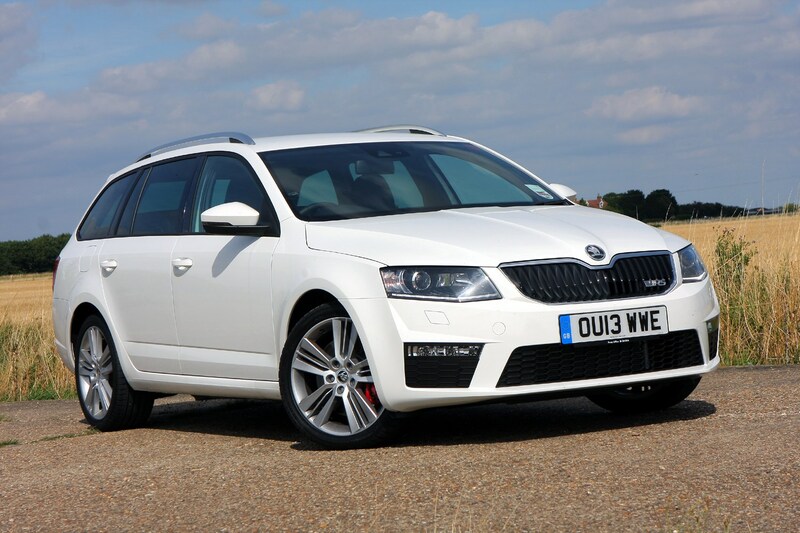 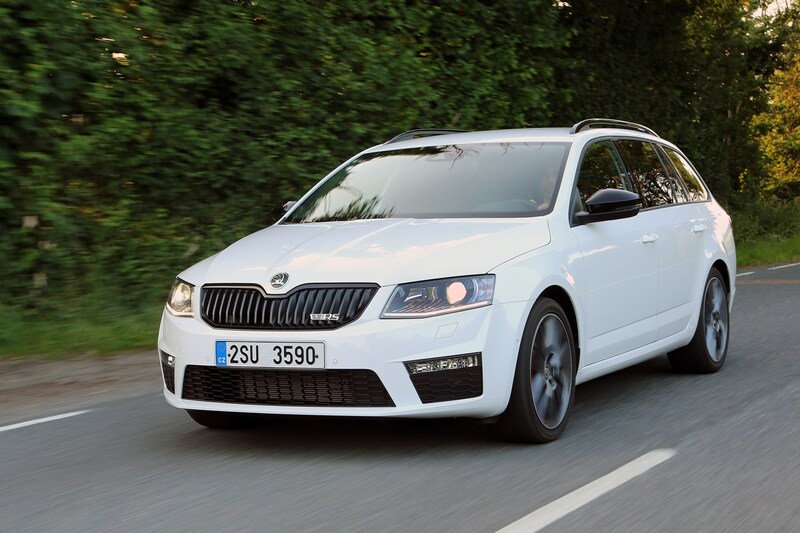 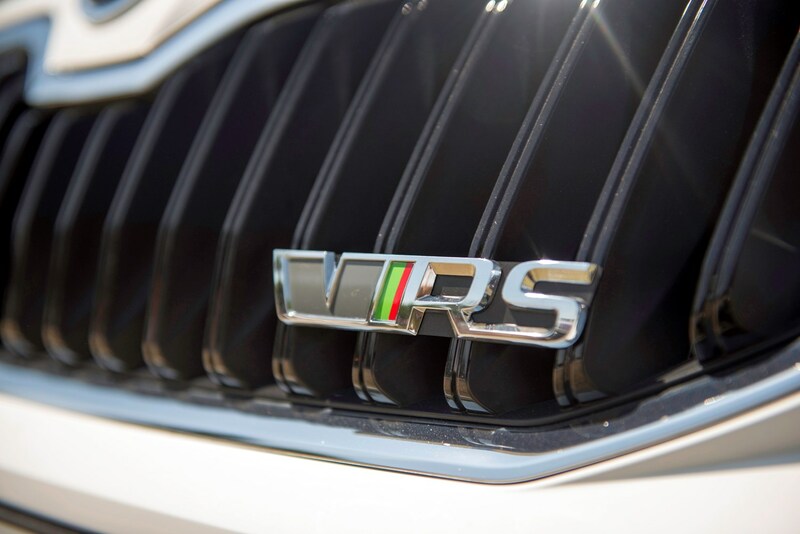 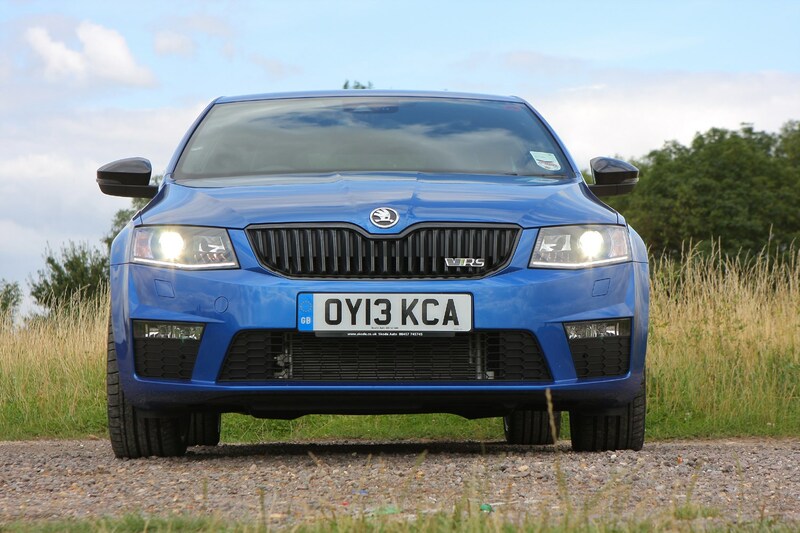 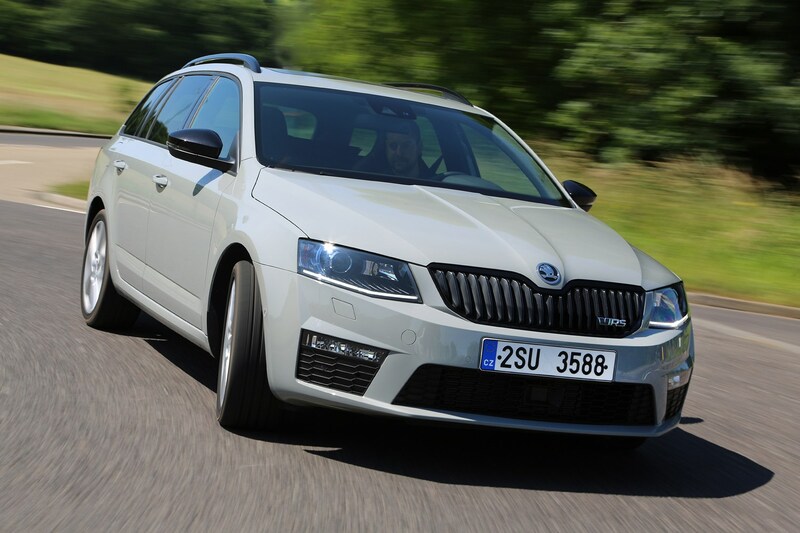 To find out more about this seriously impressive machine, read on for the full Parkers Skoda Octavia vRS review.